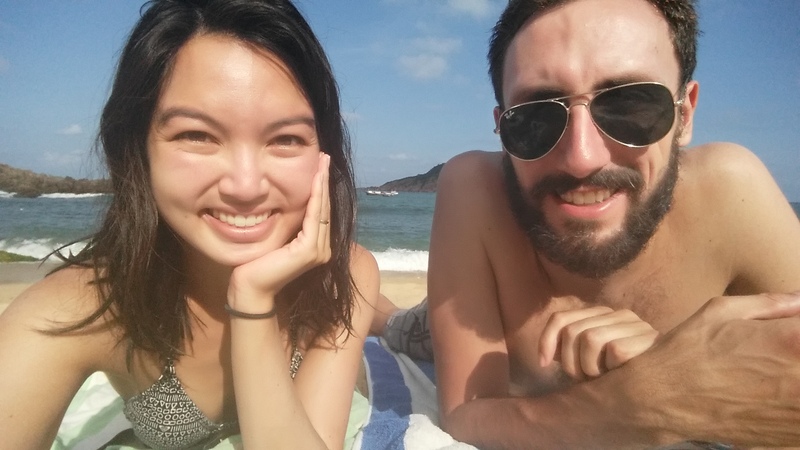 Once upon a time, I went on the adventure of a lifetime with my partner and inadequately tried to describe our incredible experiences in this blog. We traveled from Bangkok to northern Thailand, riding our scooter through misty mountain roads, stopping for coffee and pastries at tucked away mountainside cafes. 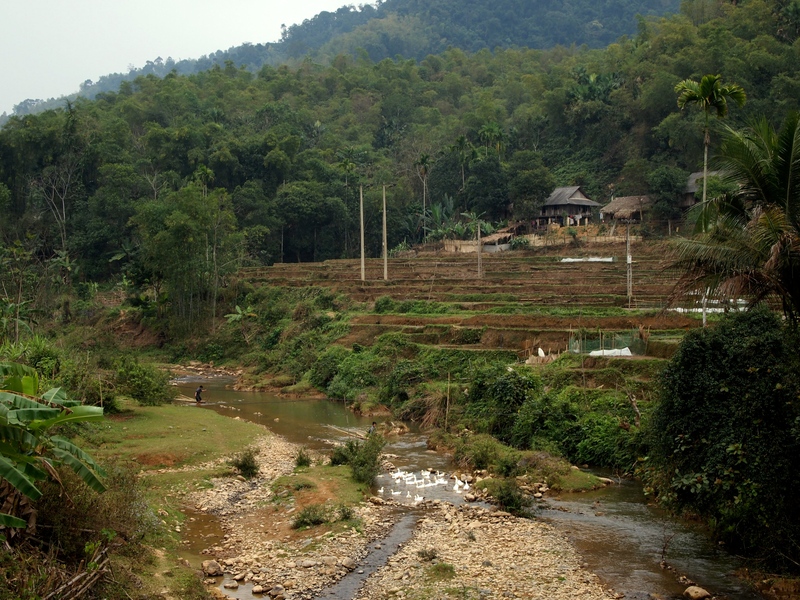 We journeyed for two days on a slow-boat from northern Thailand into Laos where we accidentally came across Hmong New Year celebrations and learned about UXO. We traveled back down through less-traveled eastern Thailand where we made some friends and ended up at a Thai social justice rock show. We hopped on over to Burma to experience the magic temples of Bagan, the peaceful serenity of Inle Lake, and the city rush of Yangon. 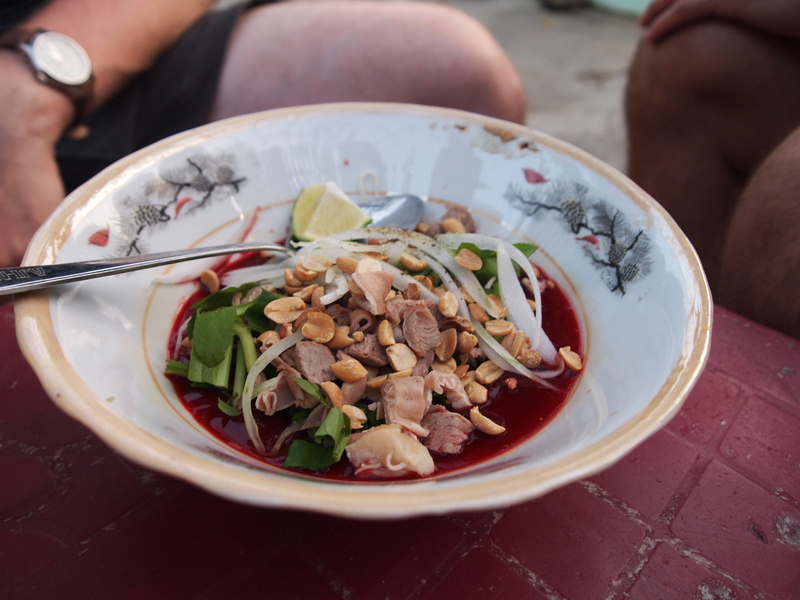 We spent the better part of a week lazing around on an almost uninhabited Thai island before tasting an explosion of flavors in Penang, Malaysia. 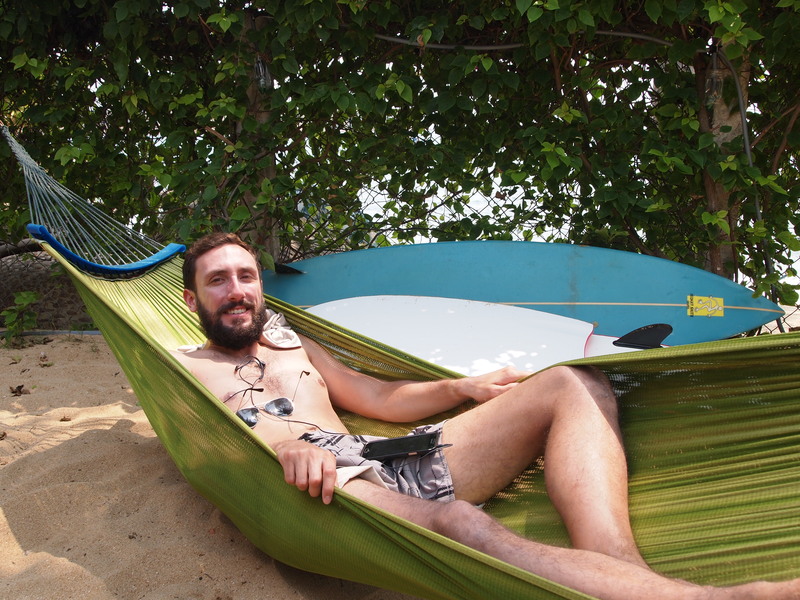 We bused down to Singapore to meet up with friends we made along the way, experiencing hospitality like no other. 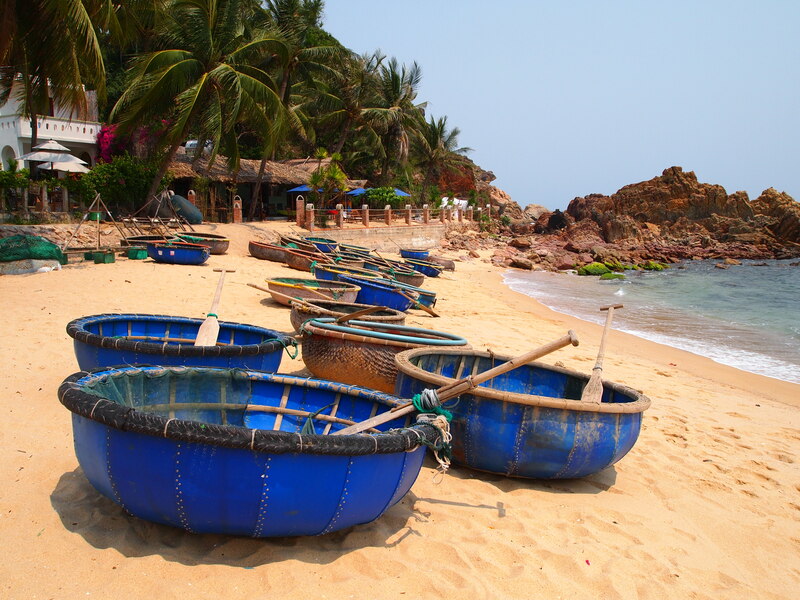 We spent over one month exploring Vietnam, epitomized by our weeklong stay in a tiny fishing village on the central coast. 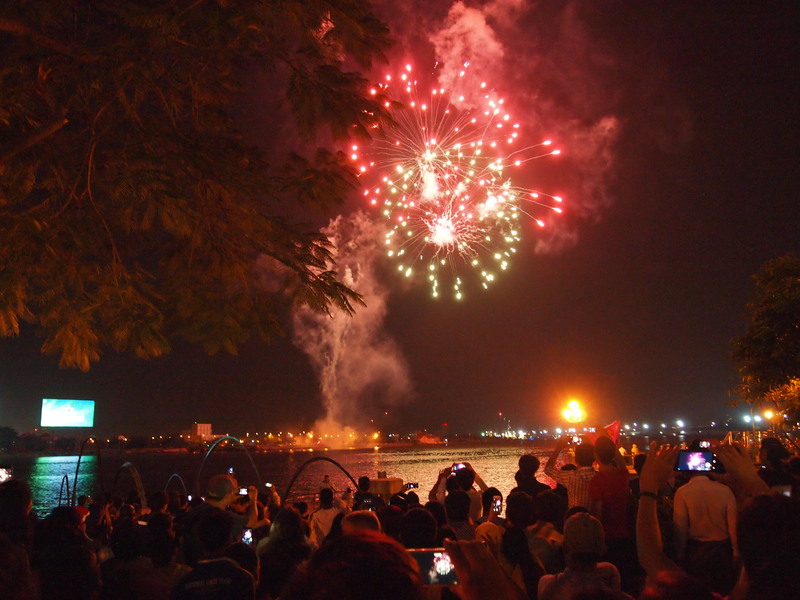 And then we made our way to the Philippines where life seemed so wonderful, it almost slowed to a stop. This last, most special part of our trip never got recorded in my blog because — and I’m not trying to be dramatic — it’s impossible to accurately describe our experience there. Every time I attempted to sit down and write about it, the task seemed too overwhelming, but I was sad to have never recorded our time here. So I’m finally just going to do it, knowing that these words can’t truly capture the magic of our time in the Philippines. We spent the first half of our time in the Philippines exploring the rice terraces around Banaue in the Ifugao region of the Philippines and cooling off in the hill-station city of Baguio, but what made our travels in the PI especially wonderful was the second half of the leg, meeting up my dear friend, Arra, and spending the last two weeks abroad with her family who live in the Bicol area and on a little heart-shaped island called Marinduque. This post will cover the first part of our trip in the Banaue area and Baguio, and I’ll revisit the magic of Bicol and Marinduque in the next post. After spending a day or two in Manila, Mitch and I took a sleeper bus north to the Banaue region, known for its incredible rice terraces. Much like our sleeper bus in Burma, this bus was absolutely frigid, and I caught a little cold. We stayed in a comfortable Airbnb guesthouse nestled in the hillside of Banaue and run by a man named Randy. The accommodations were basic with no extras but just what two budget travelers needed for a few days. 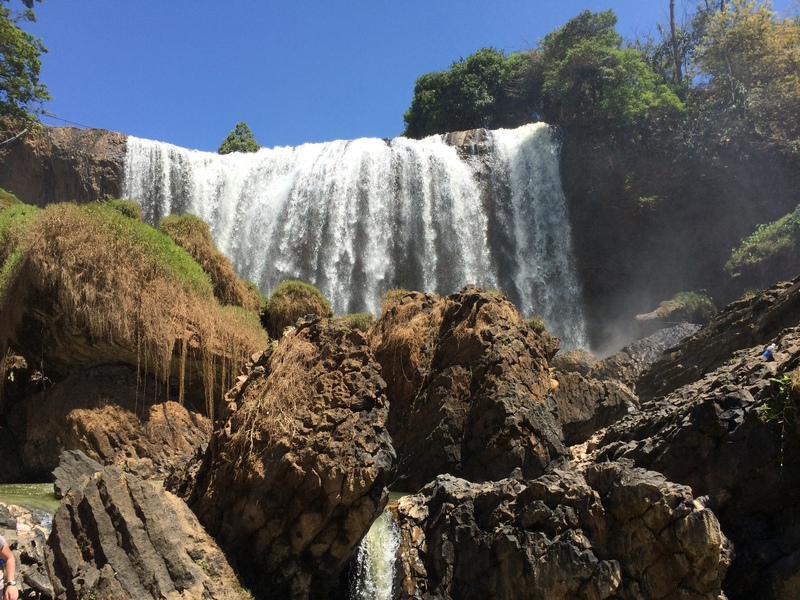 As we travelled, we learned that the local people typically point out the best sites — it’s how we ended up on the best adventures — and Randy was very insistent on what we should see and do each day. As usual, I was glad we followed his advice. On our first day, we took a tricycle/tuk-tuk to the top of the Banaue rice terraces to hike back down to the guesthouse. The view from the top was astonishing and took my breath away. 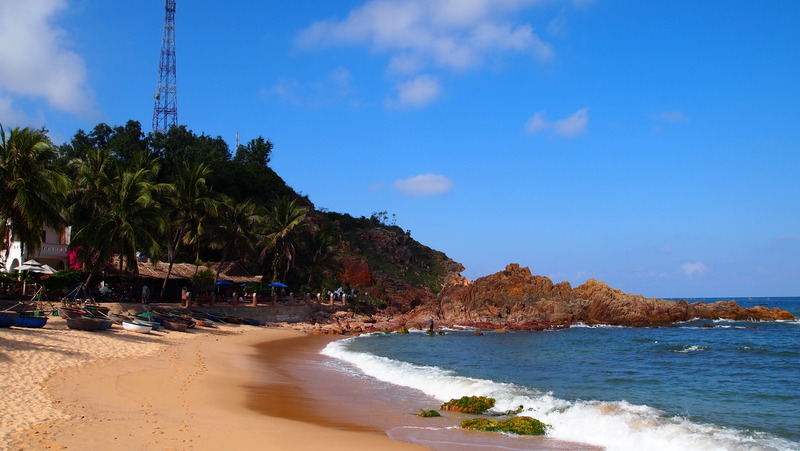 The terraces are enormous individually and altogether cover vast mountainsides and valleys. Incredibly, these handmade agricultural steps are about 2,000 years old and still in use to this day, although the ancient farming techniques and practices are fading as younger generations choose more modern lifestyles. It was a hot day, but we reveled in every moment as we picked our way down the terraces, seemingly the only people on the mountain. Since we chose not to use a guide, we tried to follow the very unmarked paths and were forced to turn around many times upon discovering we had gone astray. 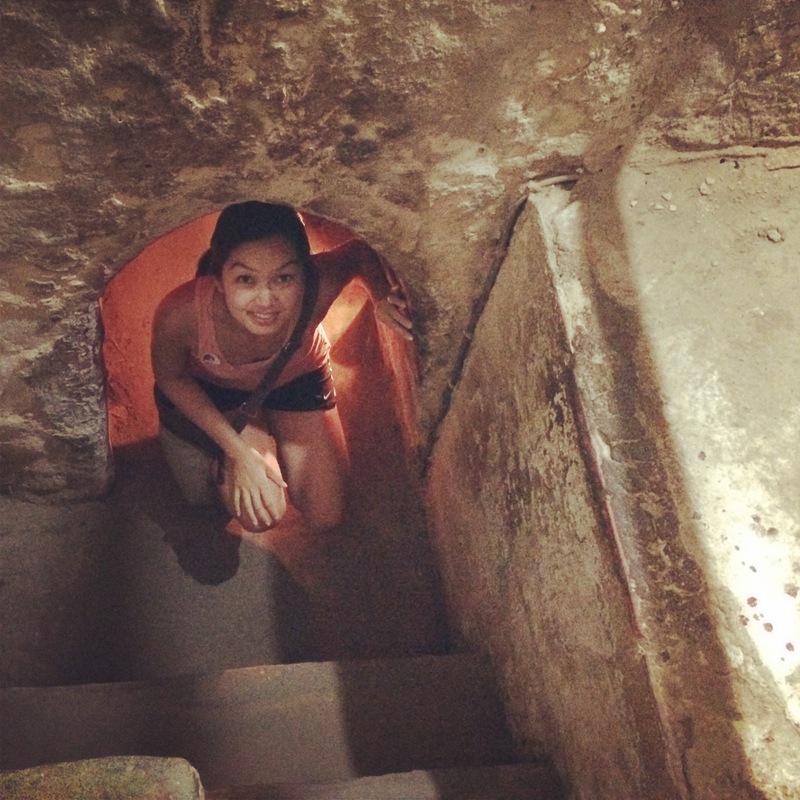 I have to say that it was so much fun and the childlike explorer in me was giddy. To this day, this is still the best hike of my life. On Day 2, our guesthouse host, Randy, recommended a hike through another famed terrace valley in Batad, a short distance away. We took another tricycle to the trailhead and spent the day hiking through the lush valley of Batad. This valley was a smaller but much greener and no less impressive than the Banaue terraces. There were more travelers hiking through this area though, as it was smaller and easier to navigate than the winding paths of Banaue. We were rewarded with a beautiful waterfall at the bottom of the valley. Our last day in the area was drizzly and gray. 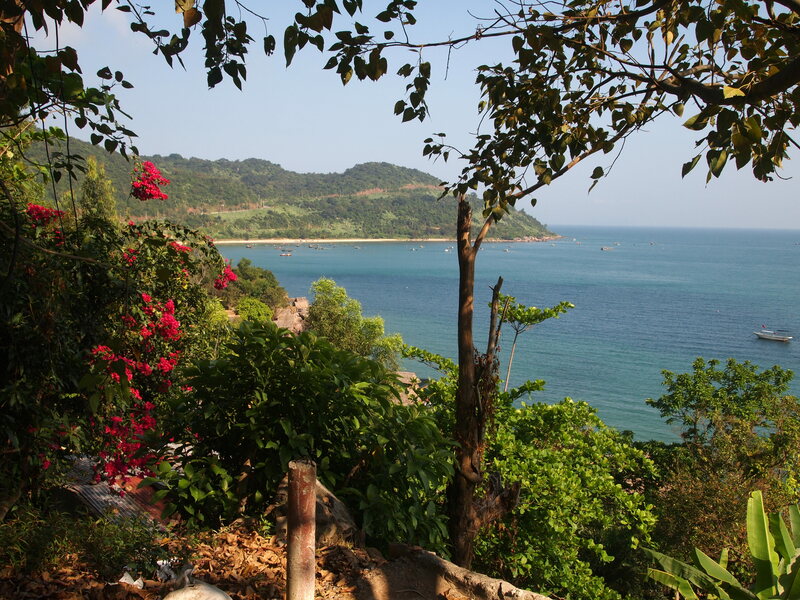 After two full days of hiking through valleys, our legs and muscles were sore, and we planned to use the day to rest and recuperate; however, Randy insisted we use our time wisely and encouraged us to hike through the Hapao terraces. 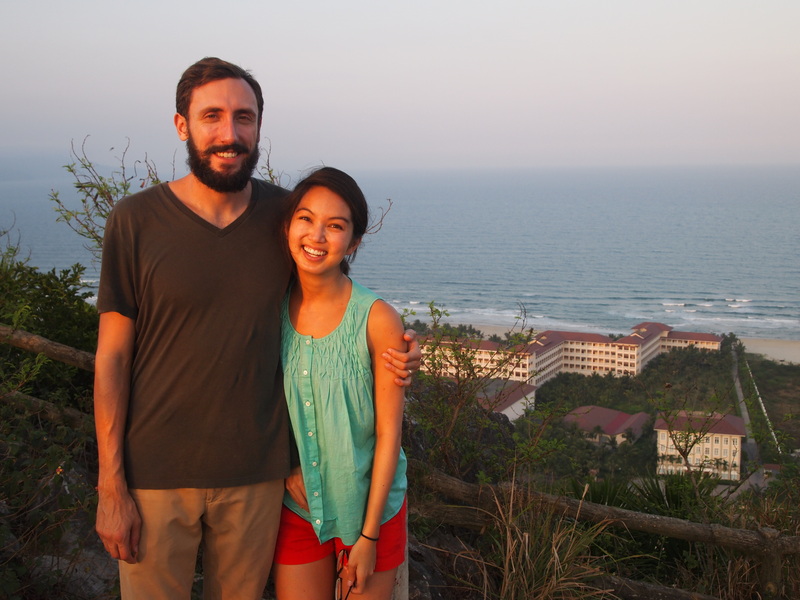 He successfully guilted us into going, and we enjoyed yet another day wandering through lush rice fields and terraces. 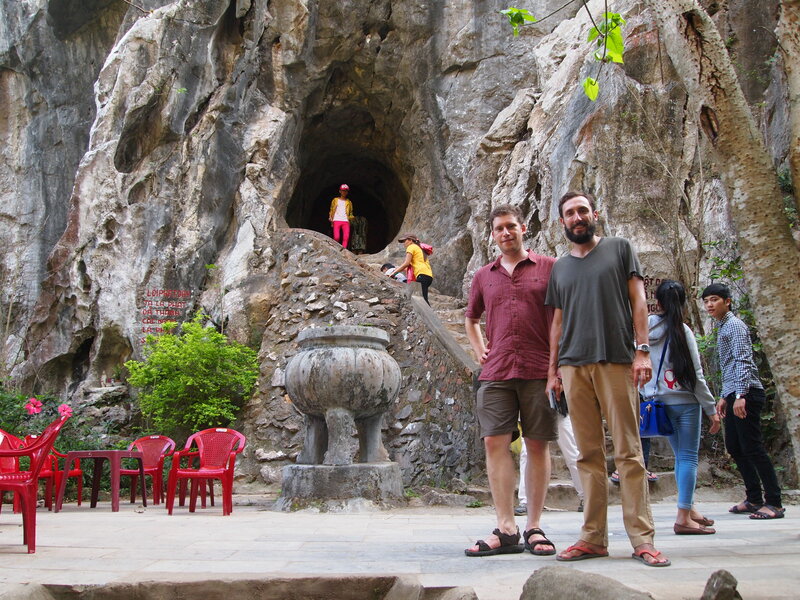 We hiked through Hapao on a cool and misty day, which gave the valley a much different feel than our last two terrace experiences. Hapao is unique in that it shelters wonderful hot springs, nestled in the valley. We rested our sore and achy muscles in the hot springs as well as the crystal clear, freezing stream beside it. That evening, I joined Randy and the village at a Catholic mass and enjoyed the service in Ifugao, Tagalog, and even a bit of English. 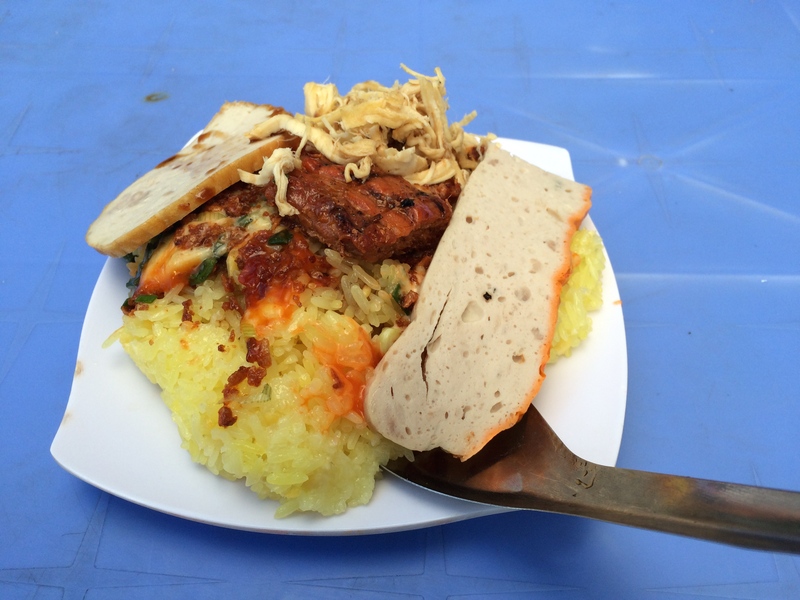 One of my favorite parts of traveling is experiencing the daily traditions and rituals of the people. 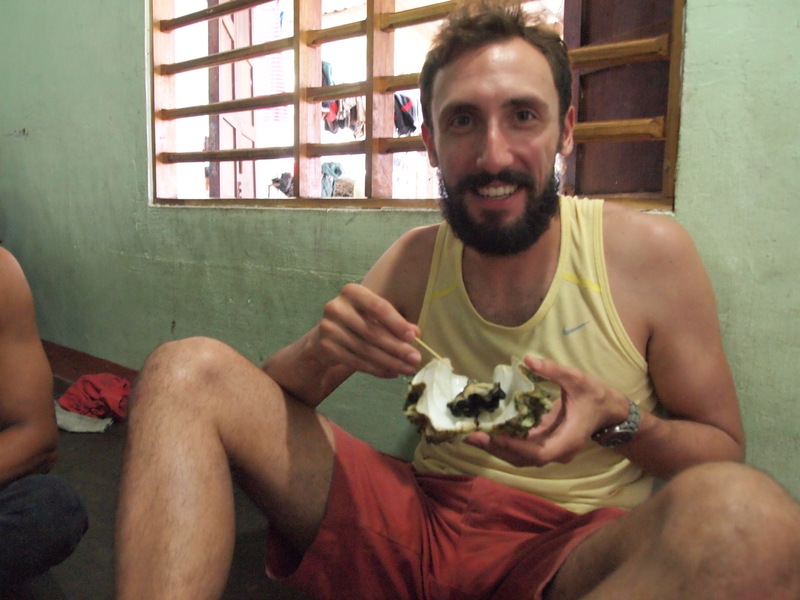 The next day, we bid farewell to Randy and hopped into a minivan on the way to Baguio. Baguio used to be a hill-station for Spanish colonizers to escape from the tropical heat of the Philippines, and when we arrived, the weather was cool and rainy. After three days of hiking through enormous rice terraces, we slowed down for a bit, taking our time to enjoy the famous local hot chocolate in a cute little cafe. We also stopped by the Philippine Military Academy as quick nod to Mitch’s days at the Naval Academy. 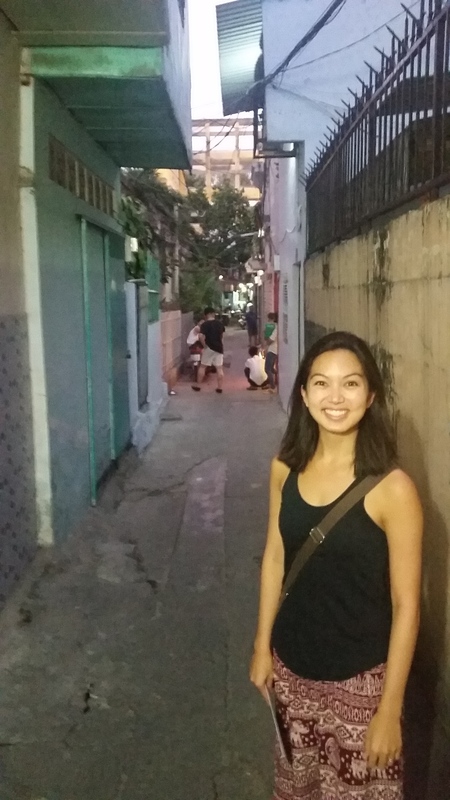 Next, we headed back to Manila for our favorite part of the Philippines trip: to meet up with my dear friend Arra and her parents on our way to visit family in Bicol and then Marinduque! My sources on social media tell me that today is World Toilet Day. It’s a bit funny that this is what brought me back to this little blog, but during our travels, bathrooms and toilets became one of the major concrete indicators of my privilege back home. 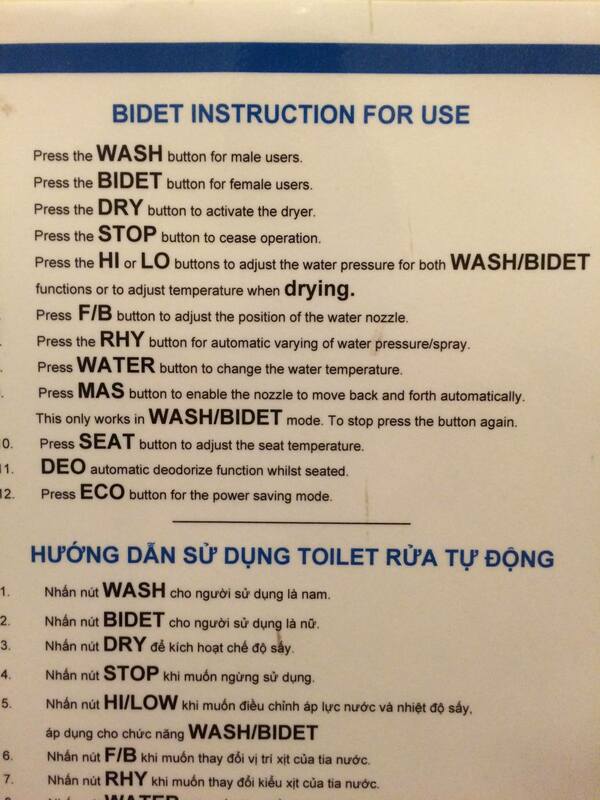 “Wash for male users” and “Bidet for female users”? What’s the difference? “RHY” for varying spray pressure? Who knew peeing could be so complicated? But sometimes toilets are not funny, especially if you don’t have one, which is the case for about one BILLION people. Not to mention the billions of other people who do have toilets but do not have the resources to maintain them to sufficient health standards. 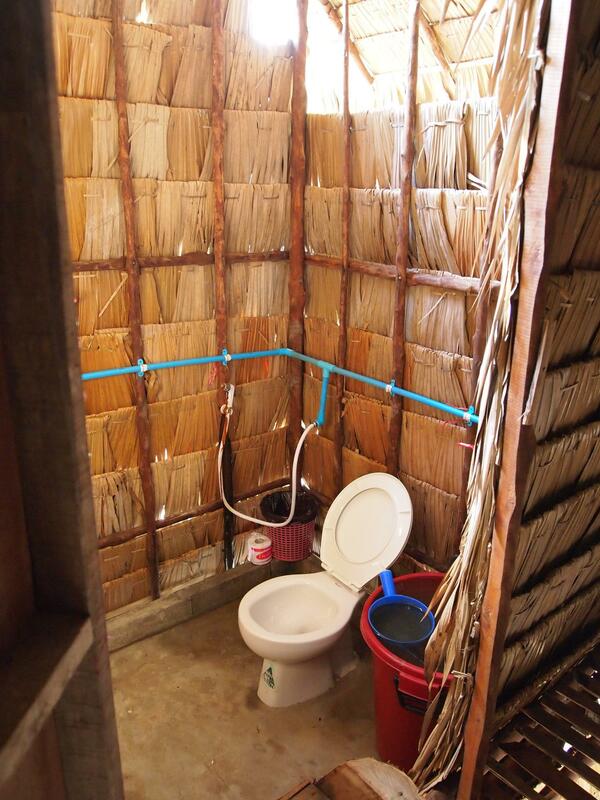 Many of the toilets we used were luxuries in the countries we visited. They were typically squat toilets in the ground but with plastic/porcelein-like fixtures without a flushing mechanism. Large buckets of water (the size of small trash cans) were stored next to the toilets and one would flush their waste using a small pail and water from the large buckets. This was a pretty messy endeavor, so bathrooms were not as clean as home. I also noticed that this method seriously attracts mosquitoes: the giant buckets of water are breeding grounds for mosquitoes which carry diseases like malaria and dengue fever. 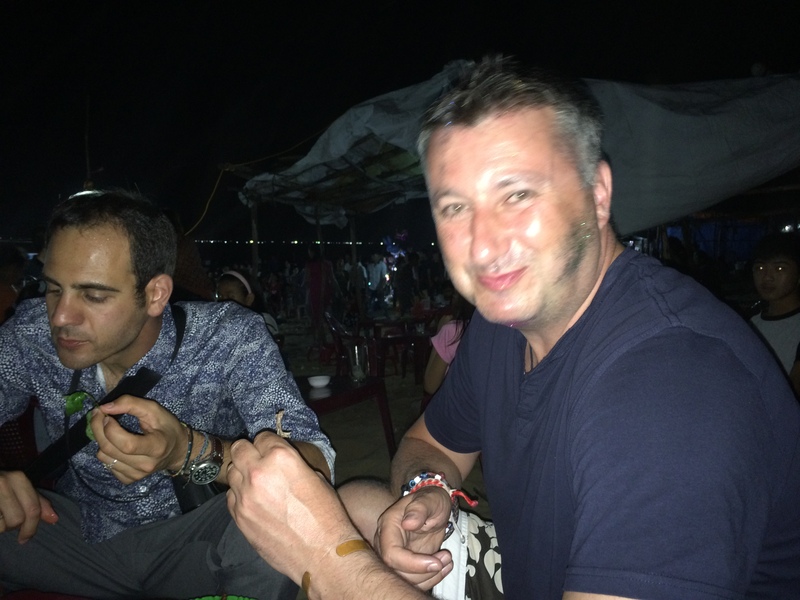 Let me just be candid here and say that I was bitten many times on my rear by mosquitoes while using toilets in Asia. But my minor injustices were nothing compared to the struggle of young girls who have to stay home from school during their periods because they don’t have access to proper bathroom facilities to dispose of their feminine products. At many schools, there is only one bathroom shared between boys and girls, and girls on their periods are shunned or made to feel embarrassed and ashamed when their feminine products are spotted in trash receptacles. It’s mind-boggling that such a seemingly simple item can have such an impact on education and self-esteem, not to mention hygiene and sanitation on a larger scale. 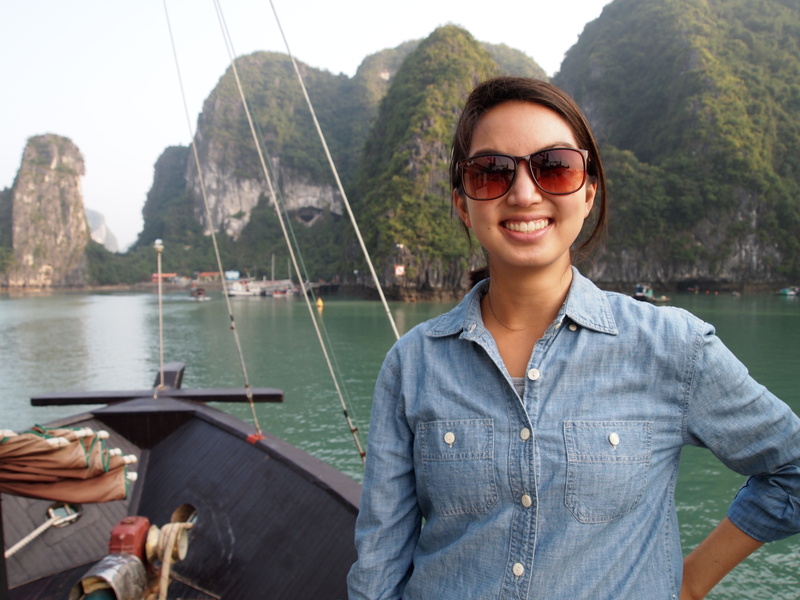 As another side trip from Hanoi, we had to visit the renowned UNESCO World Heritage site of Halong Bay. Our guesthouse mom Mrs. Dong booked our two day adventure on the bay for us, and we are so glad we went (we wished we could have stayed for three days, in fact). 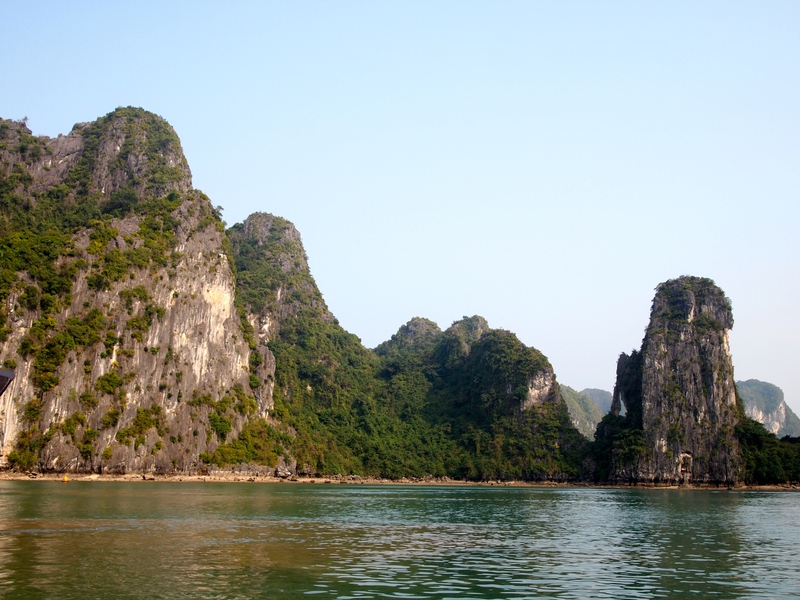 We boarded a recently renovated junk with 19 other guests at set off to explore the grandiose limestone rock formations that make Halong Bay famous. 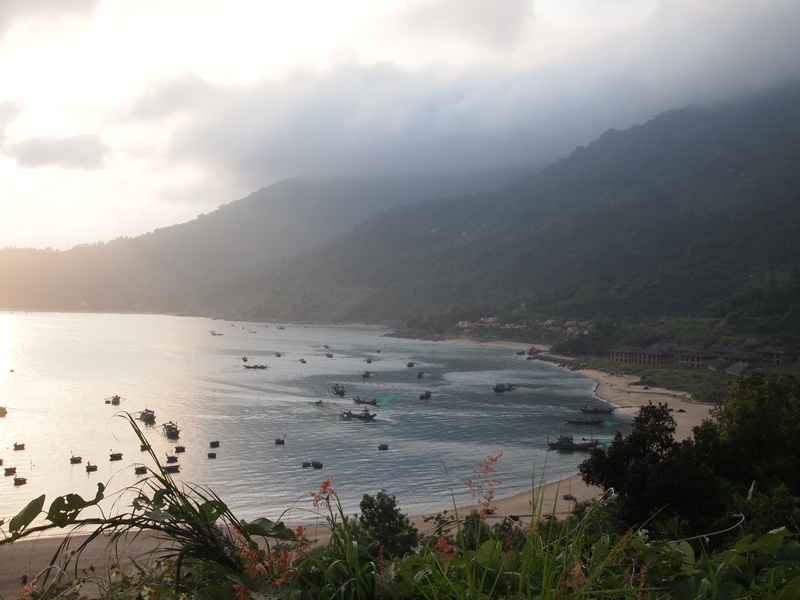 Since it was winter in Northern Vietnam, it was a bit chilly with some haziness, which affected our photos a bit; however, the views were still incredibly spectacular in person. 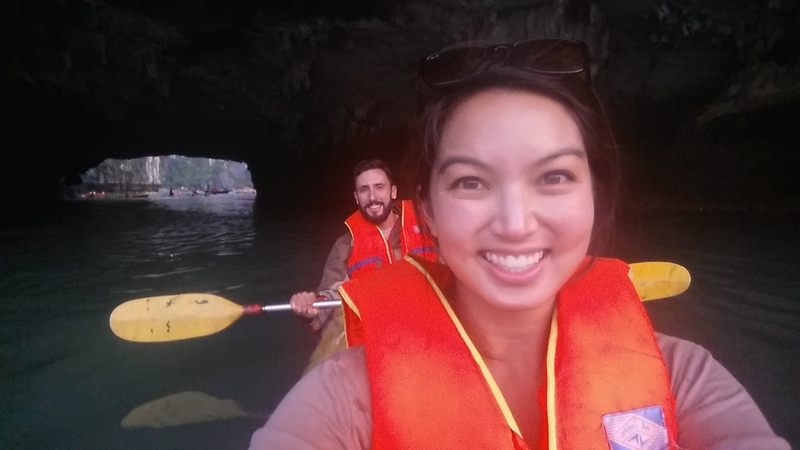 We also were excited to be able to kayak through some of the limestone caves where we saw spectacular formations and monkeys. I’ll just leave you with some photos, since the majority of our time was spent sailing around just looking at the jaw-dropping views. 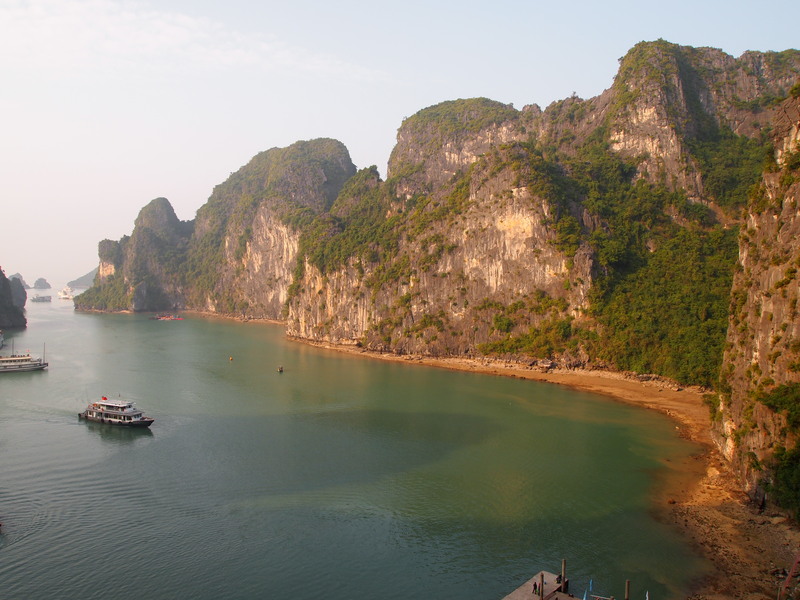 The sun is starting to set over the magnificent limestone rocks of Halong Bay. 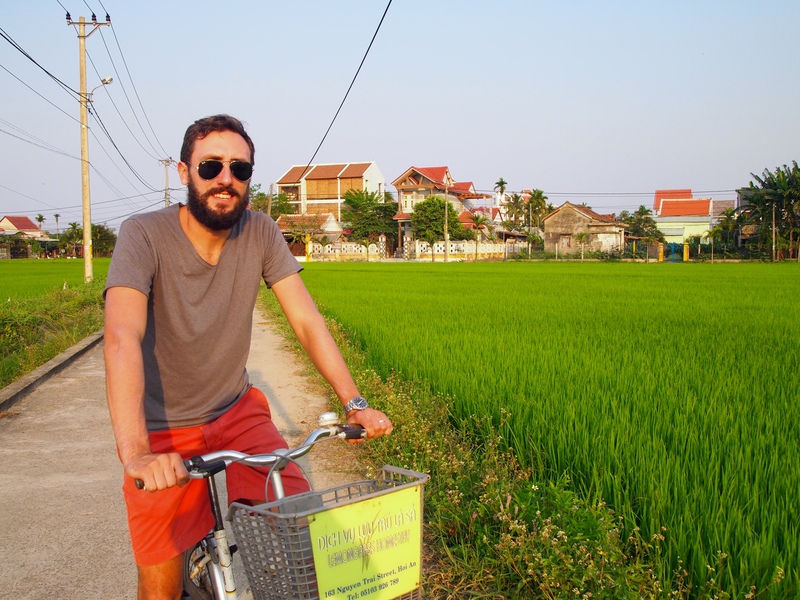 From Hanoi, Mitch and I wanted to take a small side trip to the inland mountains in order to see the famed terraced rice paddy fields. 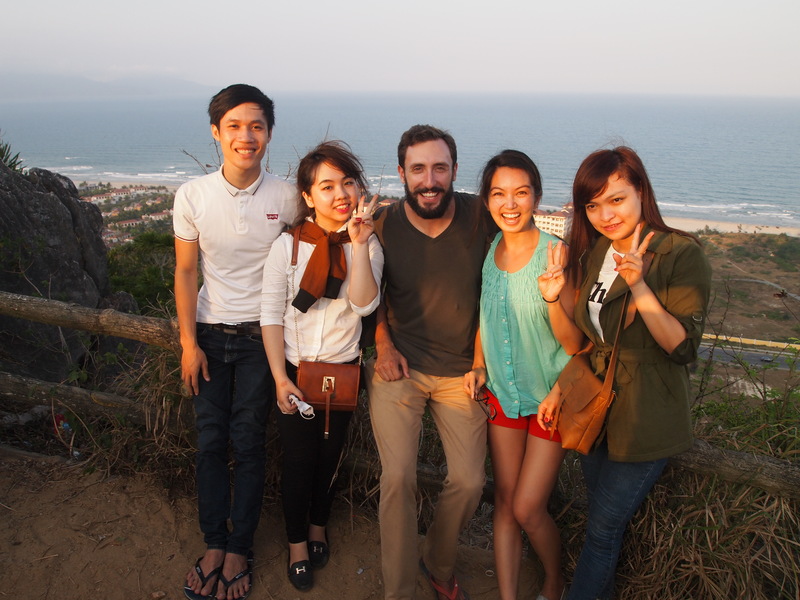 Instead of heading to tourist-saturated Sapa, we chose to go to Mai Chau, and we are so glad we did. 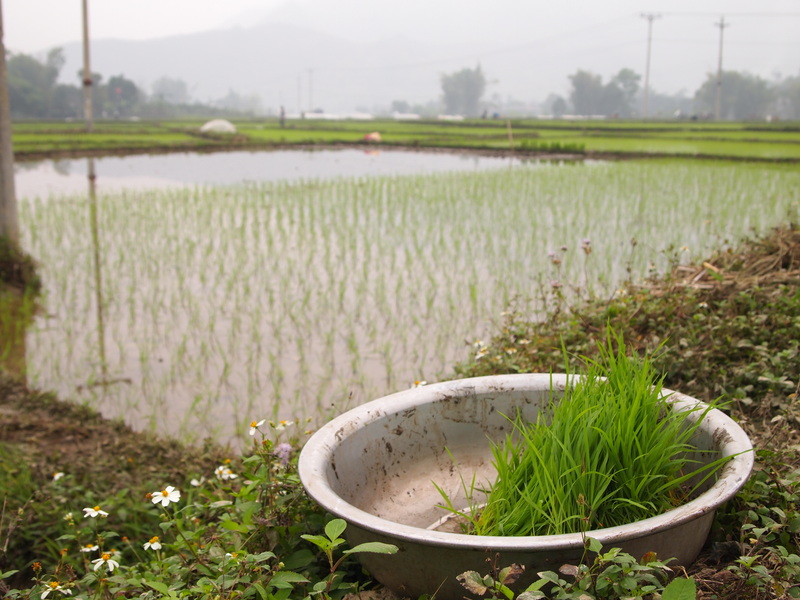 We stayed in a lovely hotel with views of the local flat field rice paddies just outside our window. 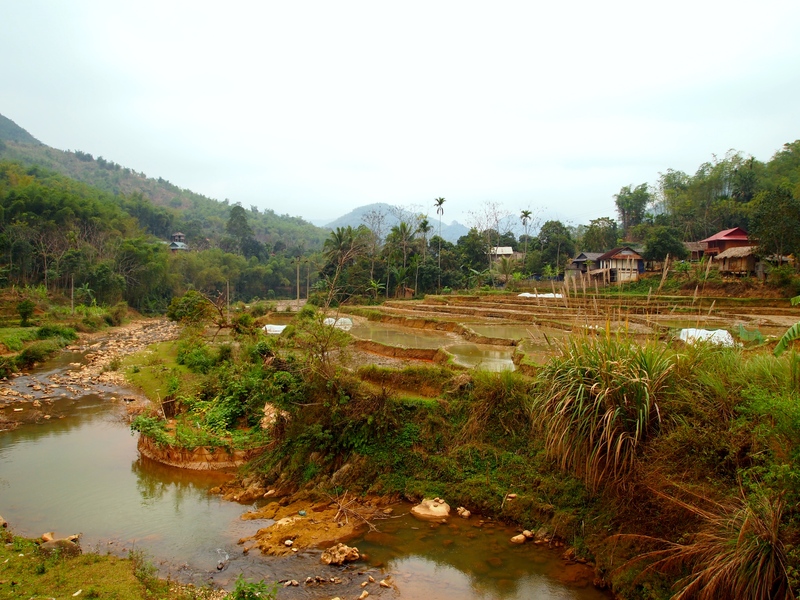 What we didn’t realize when we decided to visit Mai Chau was that mid-February wasn’t the best time for the classic photos of verdantly green and lush rice paddies. In fact, we were very lucky because when we arrived, the towns were in planting stage, which is just a 4-7 day period — something we could have easily missed had we arrived just a few days earlier! So we didn’t get to see the paddies at their greenest, but we did get to see how much hard work and labor goes into planting a rice field. 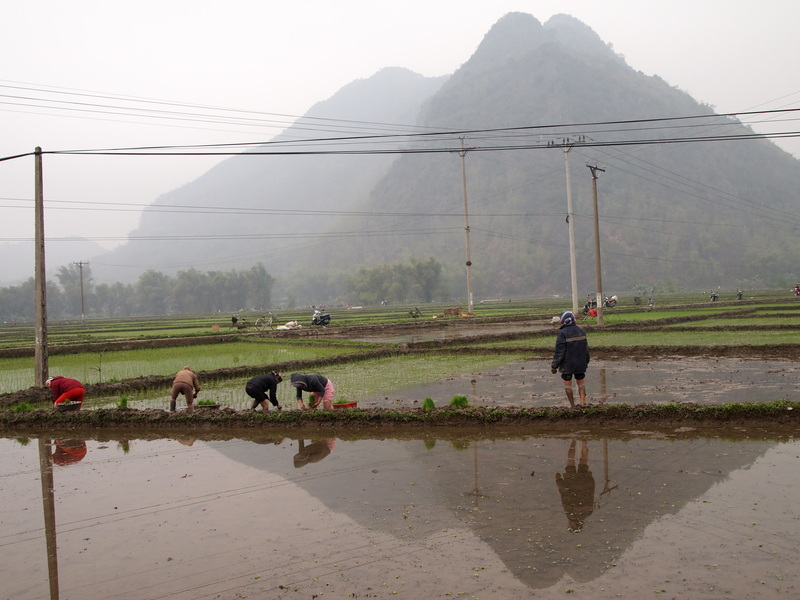 From what we could tell, the seedling rice plants are grown in a small patch just a few meters wide and long covered by plastic to protect them from the mountain chill. After the seedlings are old enough, they are gathered into a bucket and planted one by one in a flooded field. Families were up to their knees in water while the air outside was quite cold. It’s backbreaking work. Seedlings are collected into tins (foreground) and then individually, painstakingly dispersed in fields (background). You can see here that the fields farther in the background have been planted while those in the foreground are about to be. Our first day met us with misty fog, which was a bit disappointing but it did give the mountains a magical, mysterious feeling. 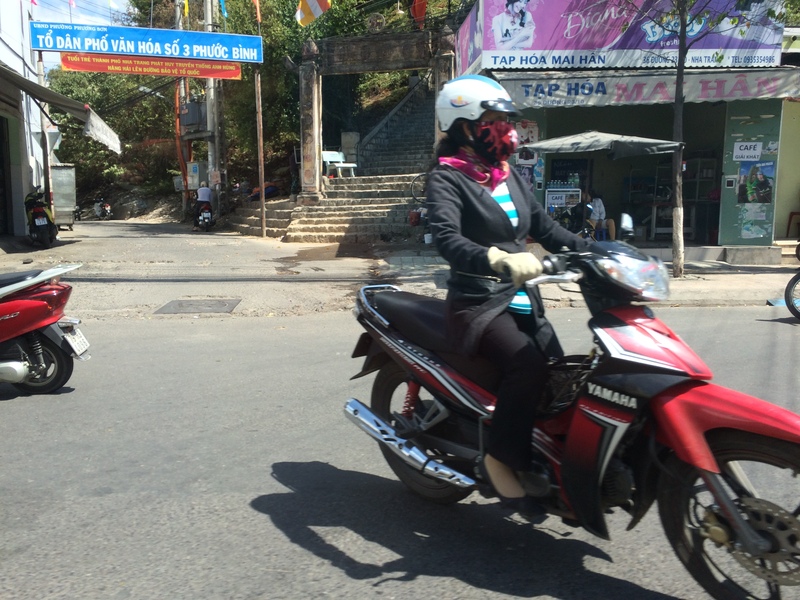 The next day was still cold, but the air was clearer, so of course, we rented a motorbike and took to the hills in search of hidden villages and beautiful scenery. 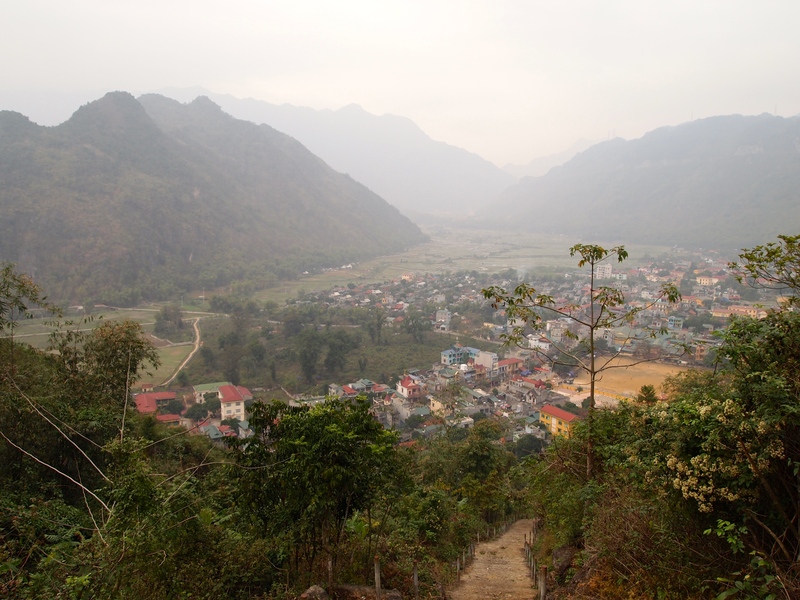 Mai Chau is a beautiful area with hard working, kind people. 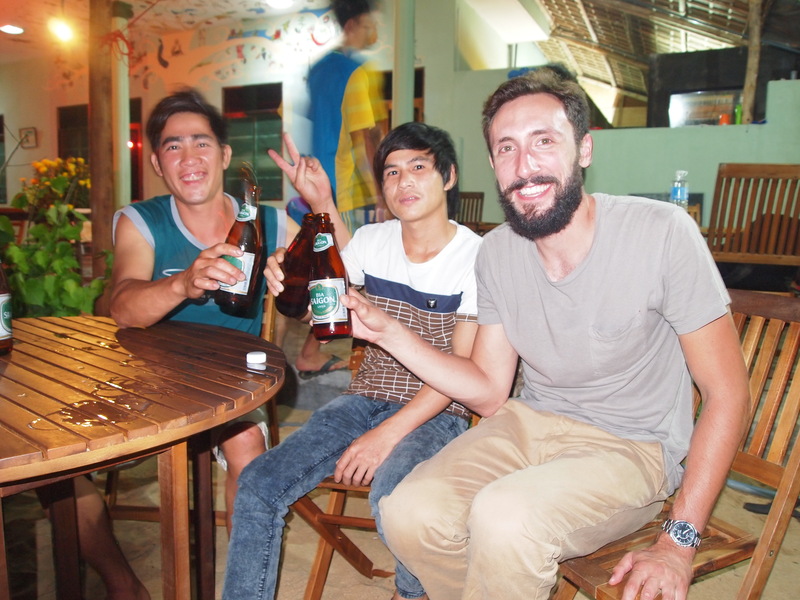 The owner of our hotel invited us for several shots of corn whiskey one evening and talked to us at length about growing rice and life in the local villages, where he grew up. 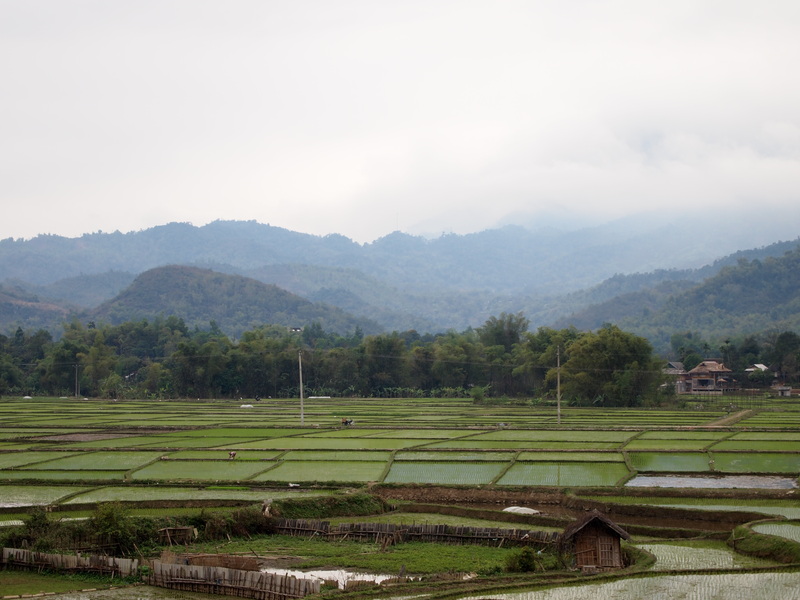 Even though we missed the peak photography season, we still found Mai Chau incredibly beautiful and I think we have a greater appreciation for the process of growing rice, a major form of income in Vietnam. 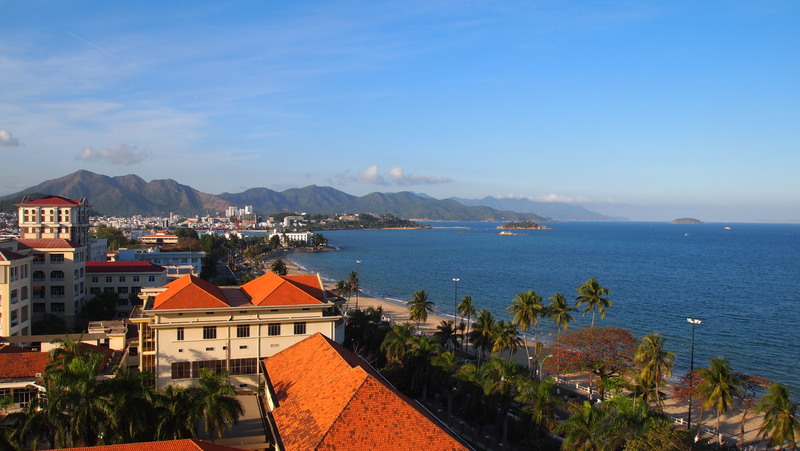 Throughout our journeys, I have been asked multiple times daily by curious locals, “Where are you from?” The answer is that I was born in the US, but my parents are both from Vietnam, which made our trip to Vietnam particularly exciting for me. 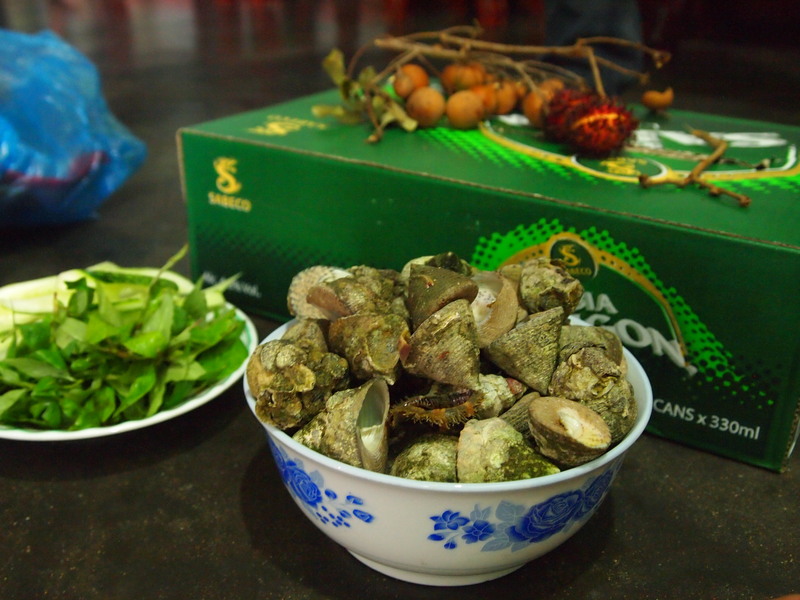 Being Vietnamese was a huge part of my childhood. I still remember when my dad sponsored his family to come to the States, little by little — when Ba Noi (grandma from dad’s side) first arrived, when my cousins came over with their parents, and so on. I don’t forget about how my father flew helicopters for the South Vietnamese army during the Vietnam War or how my mother’s family — because they were more educated than most in Vietnam — moved to Europe when she was ten to escape Communism. 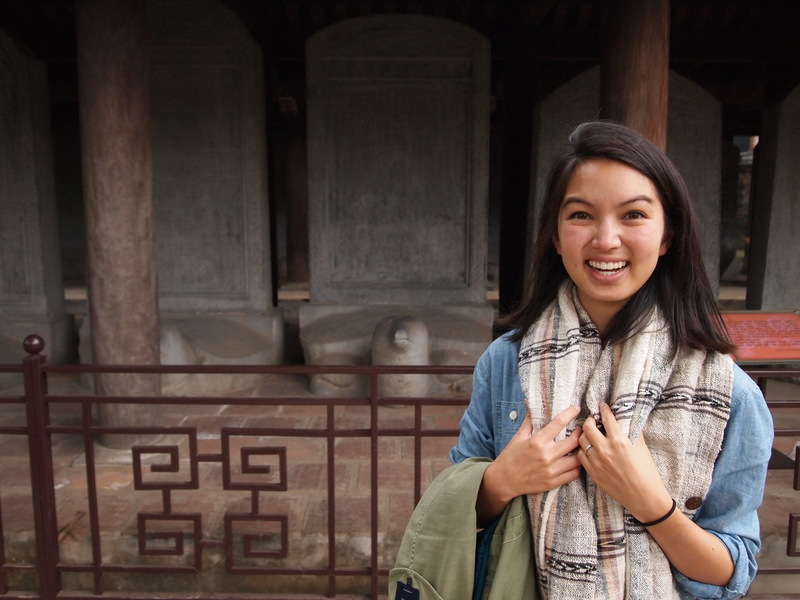 All of these things shaped my parents and directly and indirectly shaped who I am, which is why visiting Vietnam was so special to me. I wanted to see the country that molded my parents and provided the bed of cultural traditions I experienced growing up. 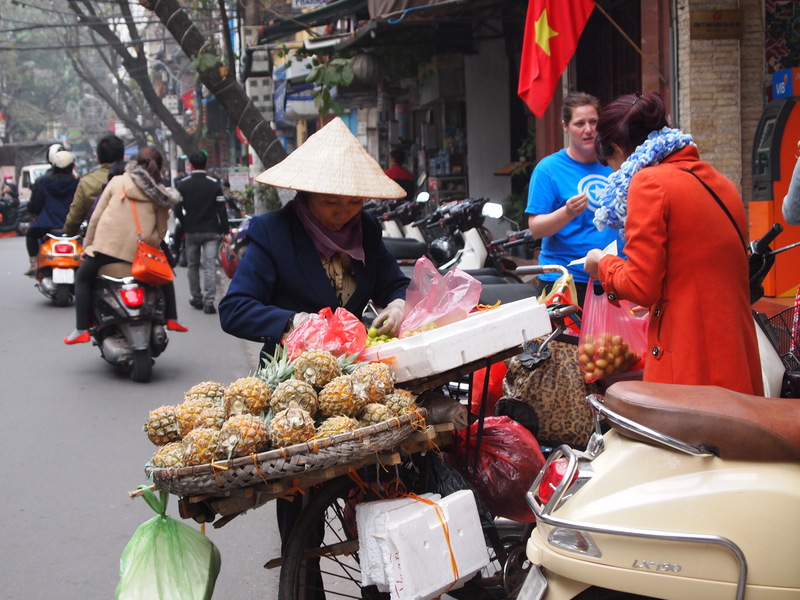 Our first stop in Vietnam was Hanoi, the capital city in the North where my mom was born. We arrived in the middle of winter, and were surprised by very cool and wet weather. 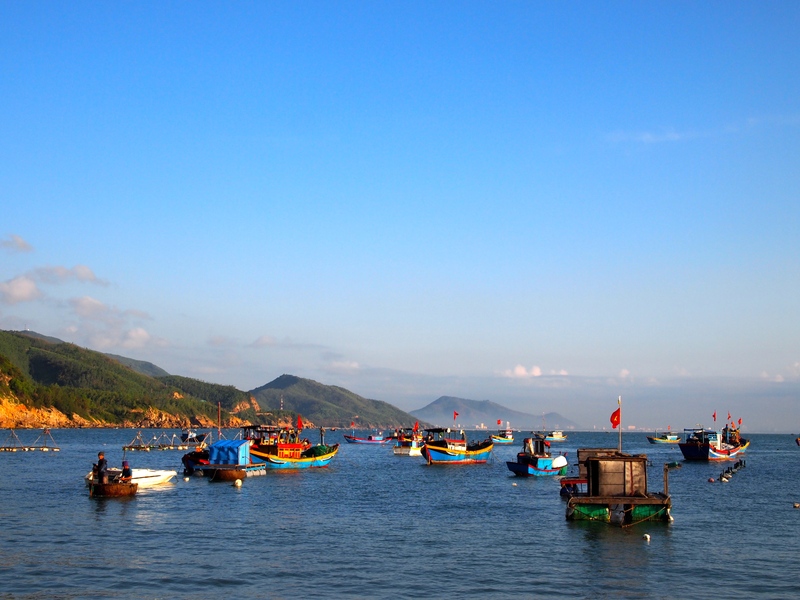 It was a welcome break from the rest of stiflingly hot and humid Southeast Asia. 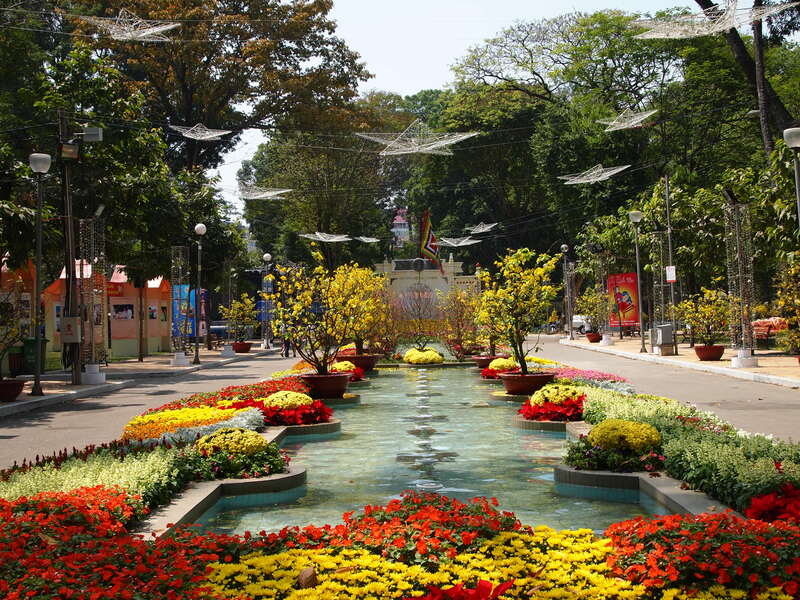 Much city life revolves around Hoan Kiem Lake around which the popular Old Quarter and French Quarter are located. 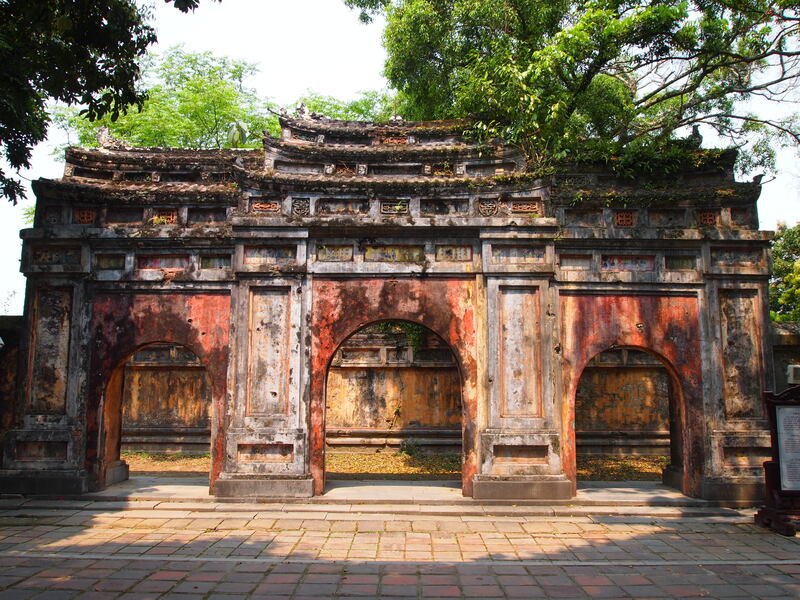 Legend has it that a giant tortoise who used to make his home in Hoan Kiem Lake stole a warrior’s sword and carried it to its watery grave. There is a temple dedicated to this legendary turtle in the middle of the lake across a cute little red bridge. Locals say there are still two large tortoises who live in Hoan Kiem Lake, but they are rarely seen. Where are you, tortoises!? 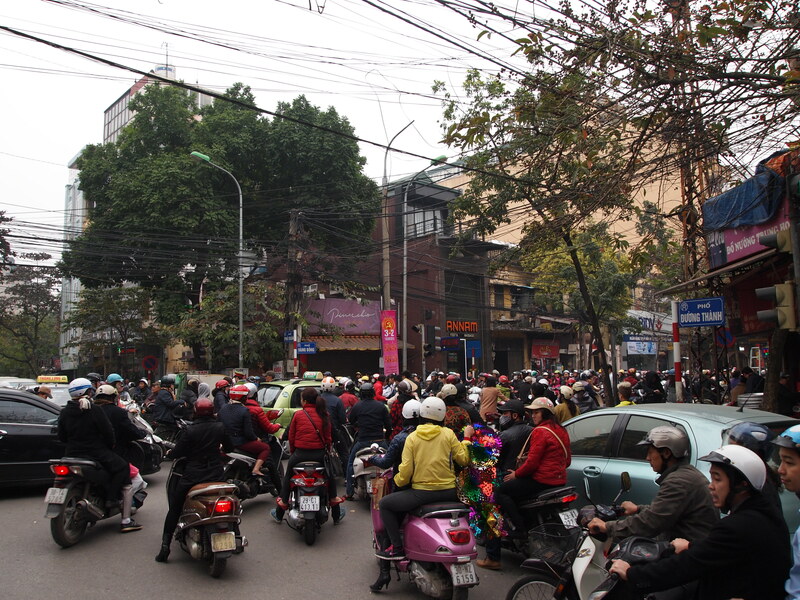 The pace of life in Hanoi is intense, probably driven by the absolutely ridiculous amounts of traffic. 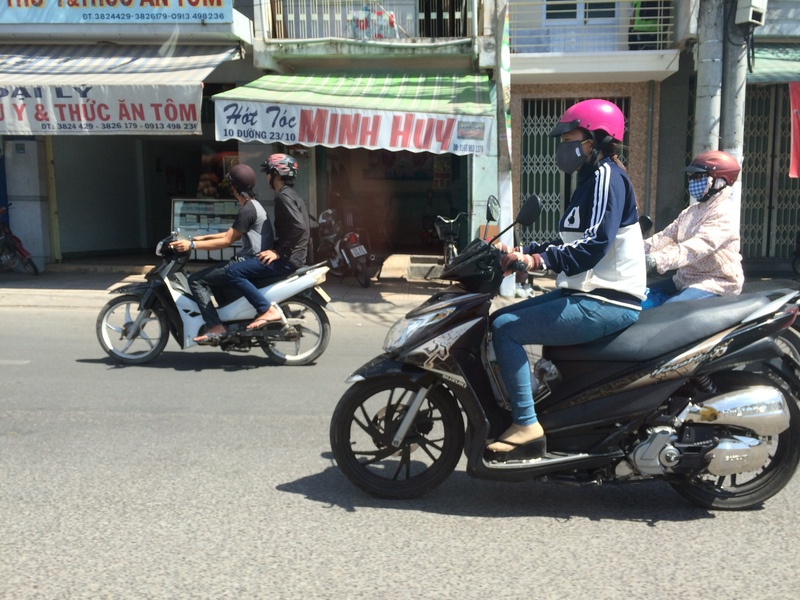 The narrow streets are flooded by a torrent of motorbikes and vehicles, all in a rush to be somewhere else. It is impossible to cross the street the way we were used to in the States, even at crosswalks. By observing, we learned the technique to crossing consists of walking out into oncoming traffic at a slow and steady pace, so drivers can see you and have time to just maneuver around you. No sudden movements, and never turn back! The trick is to move slowly and clearly enough for everyone to see you. 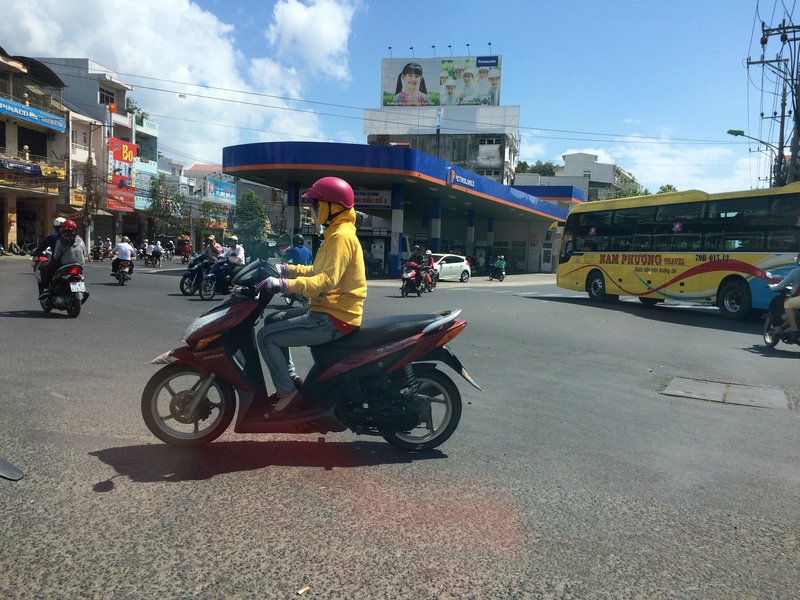 It felt ridiculously stupid and unsafe at first, but that is truly how to most effectively and safely cross the street in Hanoi. Now you know, ha! 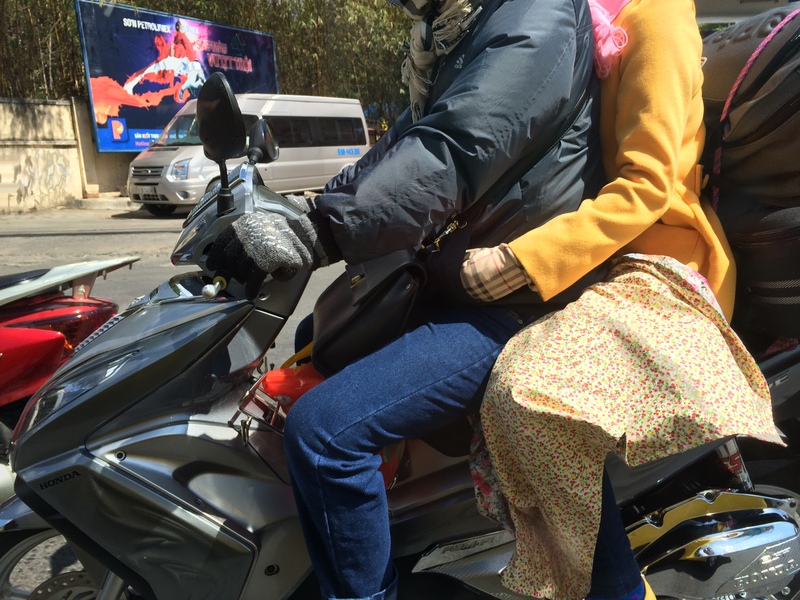 This photo doesn’t even begin to capture the insanity that is the traffic in Hanoi, but it will have to do and you’ll have to take my word for it! One hilarious part of staying Hanoi was the shoe repair men. These men wander the streets with shoe shining and repair kits looking for customers, and they are quite aggressive if they feel you need their services. Well, Mitch decided that this trip would be the last hurrah for his 9+ year old Sperry’s that he was issued at the Naval Academy in 2005. These shoes looked pretty terrible after years of wear and months of foreign travel, and this did not escape our shoe shining friends. Within one block, Mitch was accosted by at least three men who spotted his tattered kicks from across the street. They’d point to his shoes and almost demand that they be fixed. One of them even started trying to glue the soles back on as we were walking away. It was simultaneously hilarious and annoying, so after a few days, Mitch decided to avoid wearing those specific shoes at all in Hanoi, ha! 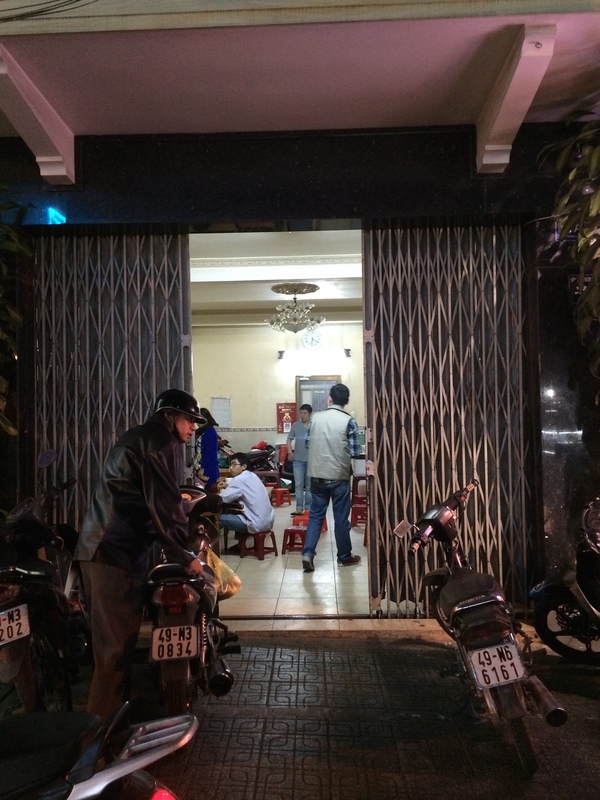 For the first portion of our stay in Hanoi, I accidentally booked a guesthouse in the middle of the backpacker district — something we have managed to avoid our entire trip. We may be backpacking, but we are not the type to be out and about all day and still have energy to party into the wee hours of the night. 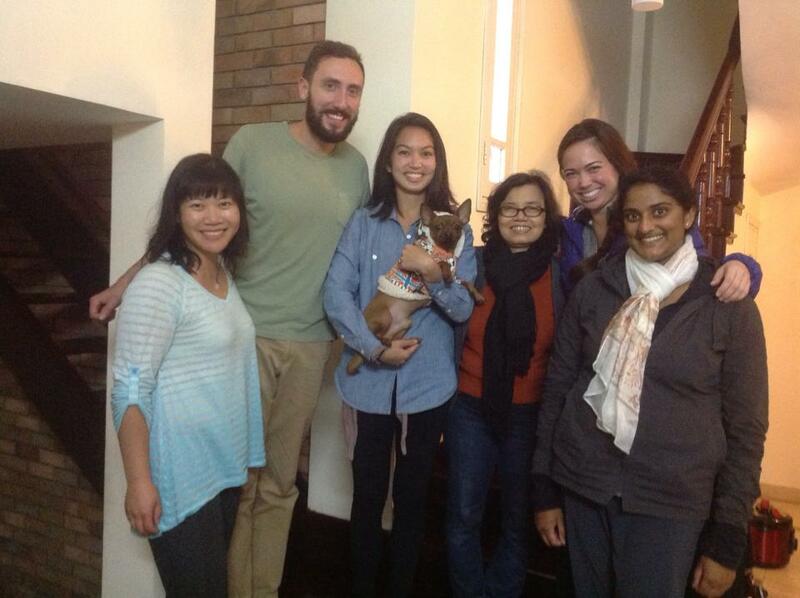 After some sleepless nights, we moved to a wonderful homestay outside the tourist area where we were hosted by Mrs. Dong, her friend and colleague Narelle, and their dog, Caru. 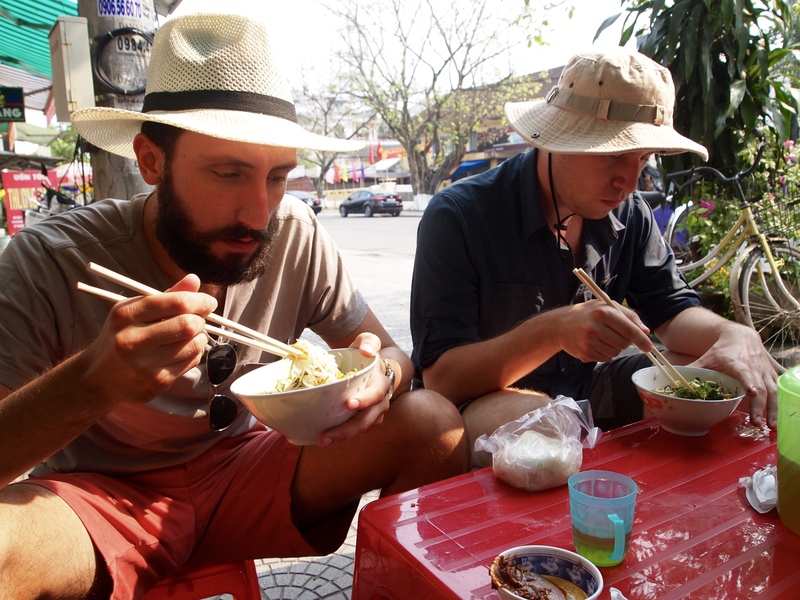 They were absolutely wonderful and took amazing care of us as well as giving us wonderful recommendations of where to grab some good eats and what to see around Hanoi. 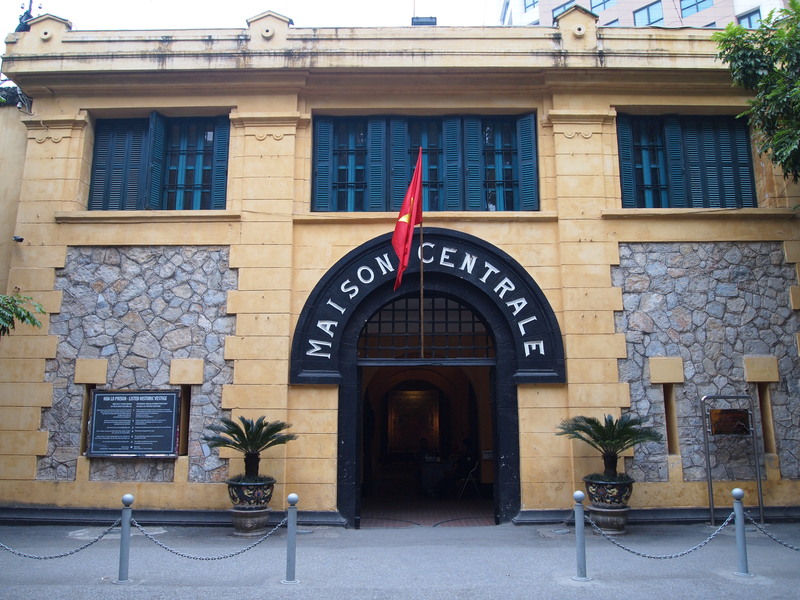 One of our first stops in Hanoi was the Maison Centrale, or the “Hanoi Hilton,” as it is sarcastically referred to by Vietnam veterans. This is the prison where South Vietnamese and Americans were held by the North Vietnamese army during the war. I was very impressed with the museum quality displays and the condition that that old buildings were kept. Everything was very well done; however… the information given was incredibly, incredibly one-sided and full of propaganda in favor of the North Communist Party, of course. I won’t go into detail, but I was actually very upset by some of the lies being broadcast to Vietnamese citizens and tourists visiting the prison. The plaques described how well-treated the US prisoners were and how “lucky” (their words) they were to be prisoners under the Communist rule. It’s no secret that the US committed unspeakable atrocities during the Vietnam War, but it was also insulting to be told that the North Vietnamese were nothing but gentleman to US soldiers. This type of propaganda permeated all war-related sites throughout Vietnam. It’s really interesting to think about history and how people in power can shape and change the narrative, history, and perspective of a country. 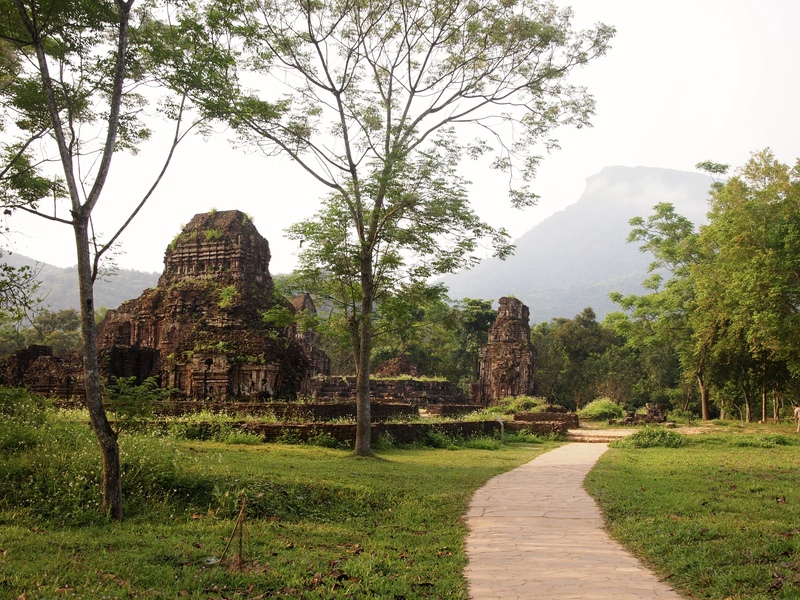 The entrance to Maison Centrale, once controlled by the French during their colonizing days and subsequently by the North Vietnamese during the Vietnam War. 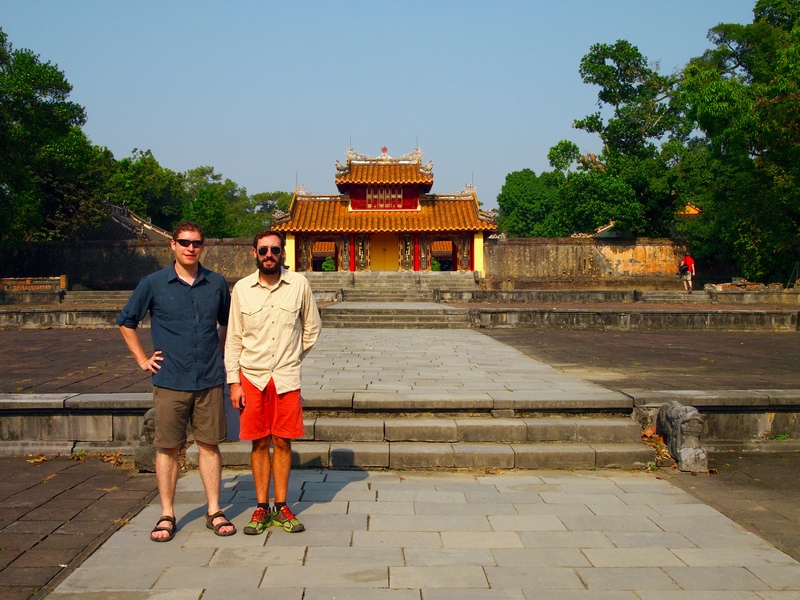 On Valentine’s Day, Mitch and I spent a romantic morning visiting Ho Chi Minh’s mausoleum (ha ha!). It was a rainy morning, and we queued up and shuffled through the walkway to see the Communist leader’s embalmed body. 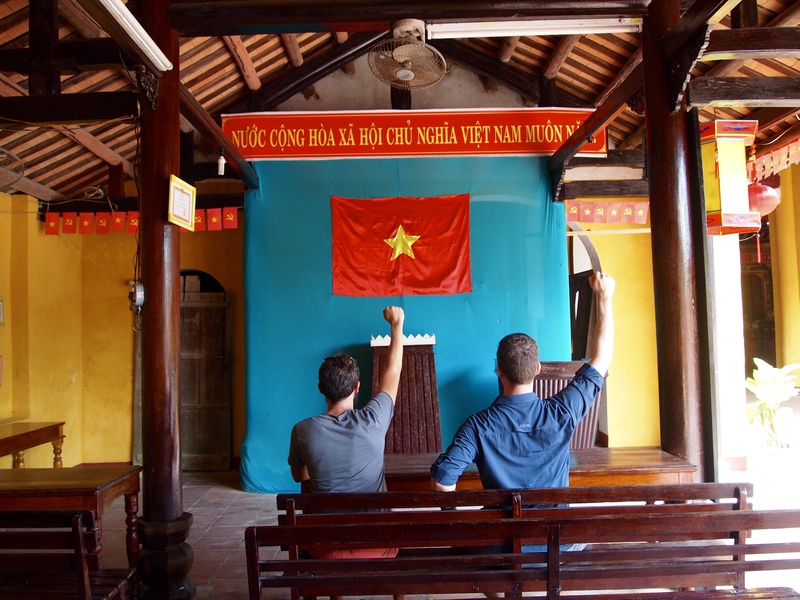 The experience was quite strange: we queued up almost single file and were led into the mausoleum where we walked down a quiet corridor and finally into the main room where Ho Chi Minh was surrounded by an orange glow and ogling tourists. Did you know that Ho Chi Minh requested to be cremated but is now flown yearly to Russia for annual “spa” treatments (read: he has to get re-embalmed yearly in Russia)? Yea, talk about a romantic day! 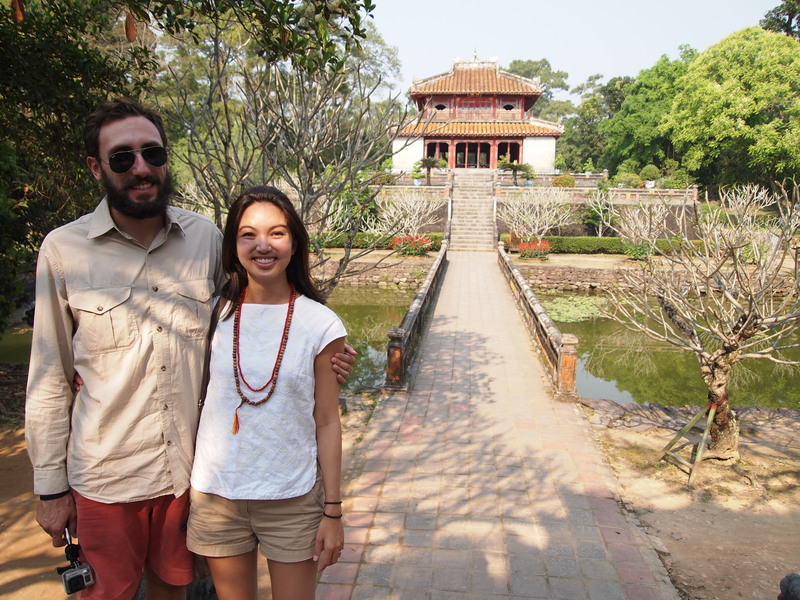 We also visited the Temple of Literature, which was built in 1070 as a temple dedicated to Confucius and served as the Imperial Academy. 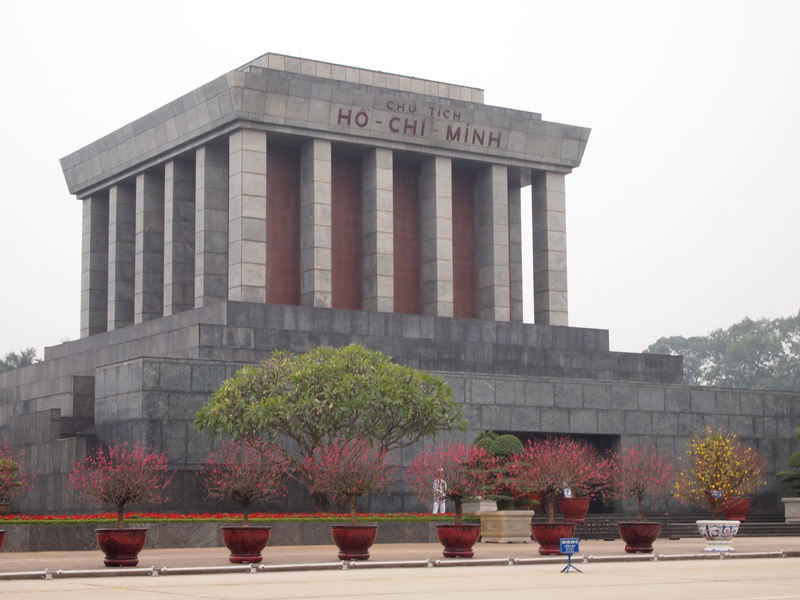 Ho Chi Minh’s sombre mausoleum dominates the skyline on the street where is located. 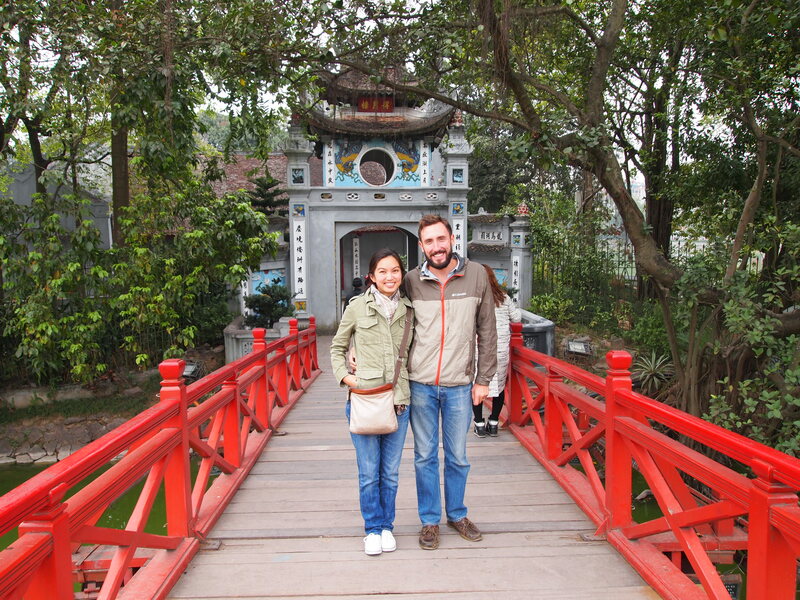 Excited at the Temple of Literature because of turtles carrying engravings! One of our favorite days in Hanoi was visiting the Blue Dragon weekly football (soccer) games on Sunday morning. 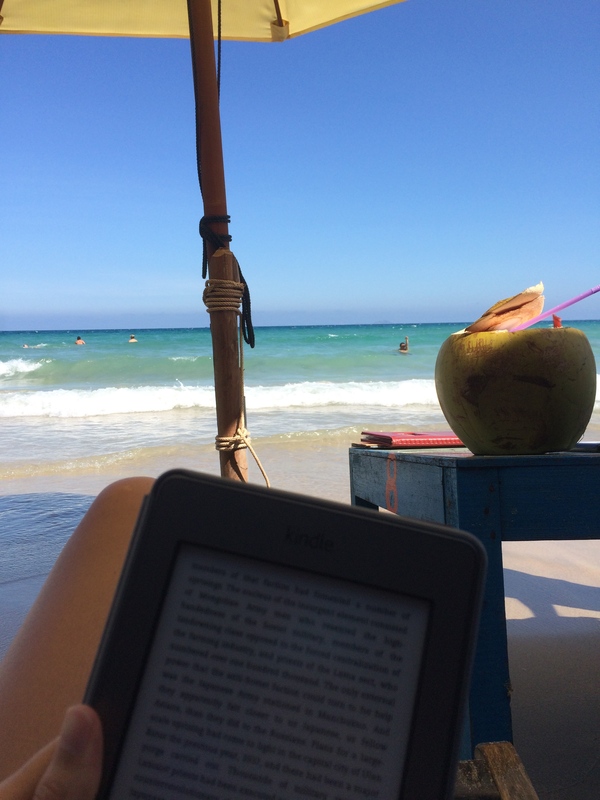 I heard about Blue Dragon from our friend Rebecca who we met in Koh Phra Thong, Thailand. She had volunteered for six months with the organization, which assists disadvantaged youth, and put us in touch with her friend Tho who organizes the weekly soccer games. 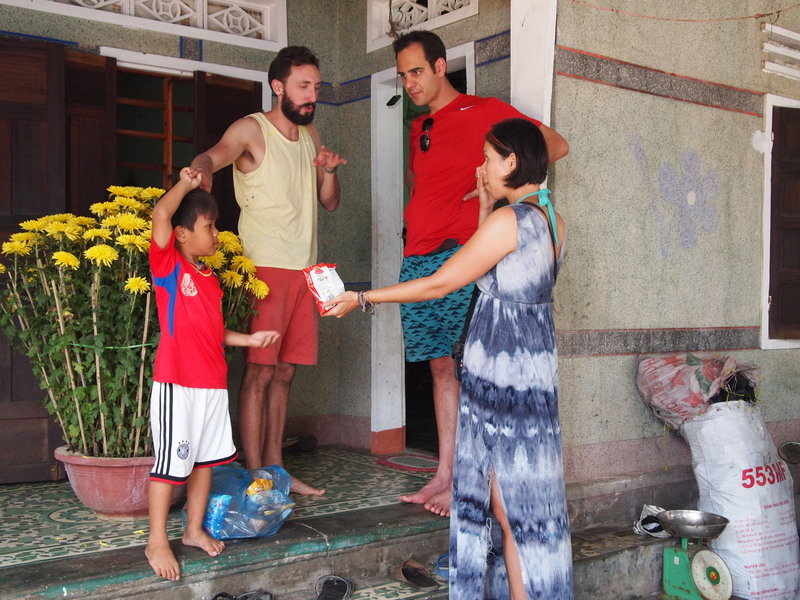 It was eye opening to escape the tourist trail and see another side of Hanoi as well as the kids who absolutely loved playing football. 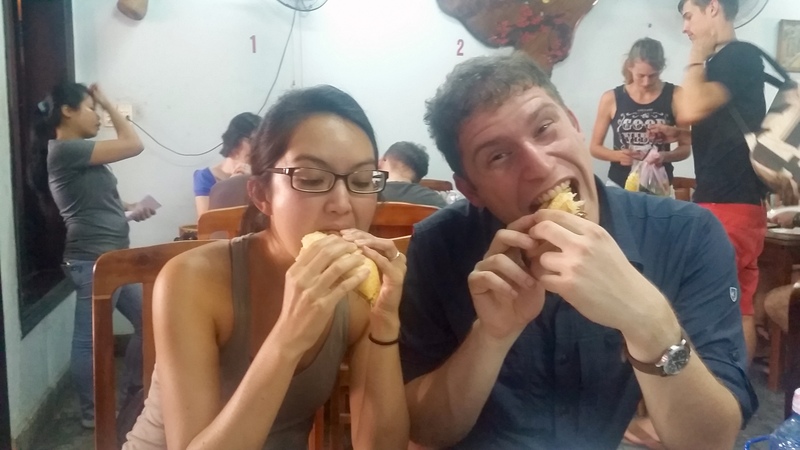 After the morning games, Tho was so kind and took us to to some of the best local food joints, including a Hanoi original: ca phe trung, or egg coffee. Egg coffee consists of a small amount of very strong coffee topped with whipped egg yolk and cream or condensed milk. It tastes like a little bit of heaven flavored with tiramisu. This cafe was so hidden, there’s no way we would have ever found it without a local! In order to enter, you have to go through a storefront that looks just like another tourist store, walk down a narrow, empty alley, then into the cafe entrance. 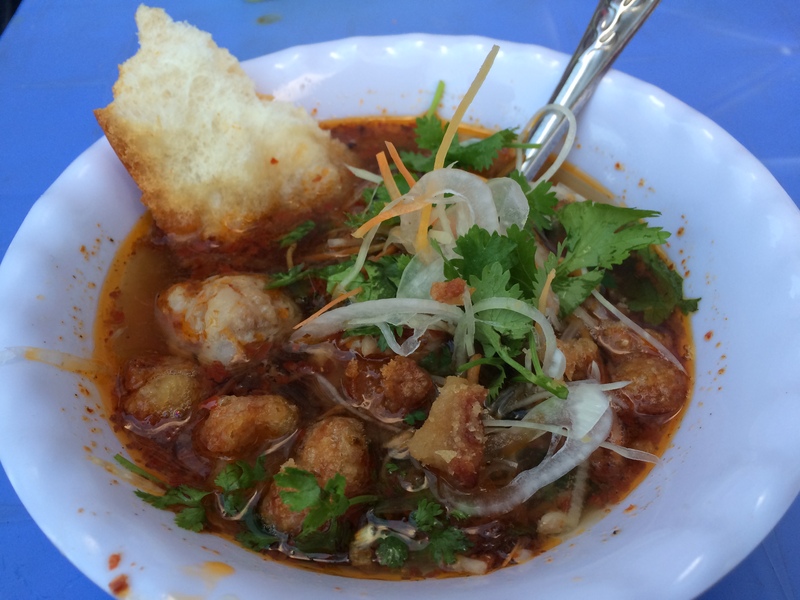 We climbed three stories for a seat with a beautiful view overlooking Hoan Kiem Lake and enjoyed our ca phe trung and the company of our new friend. 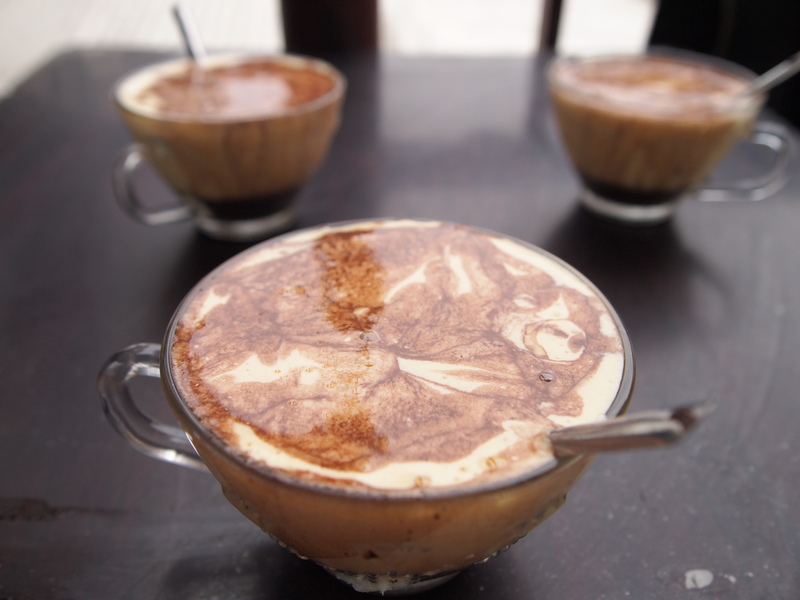 Egg coffee: a little cup of heaven flavored with tiramisu — yum! 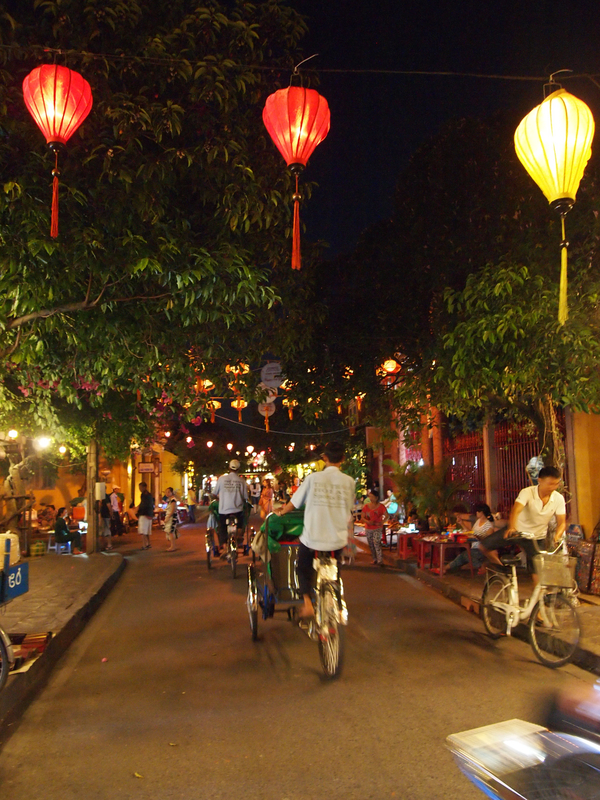 Tho also took us out that evening to the Old Quarter Walking Street. 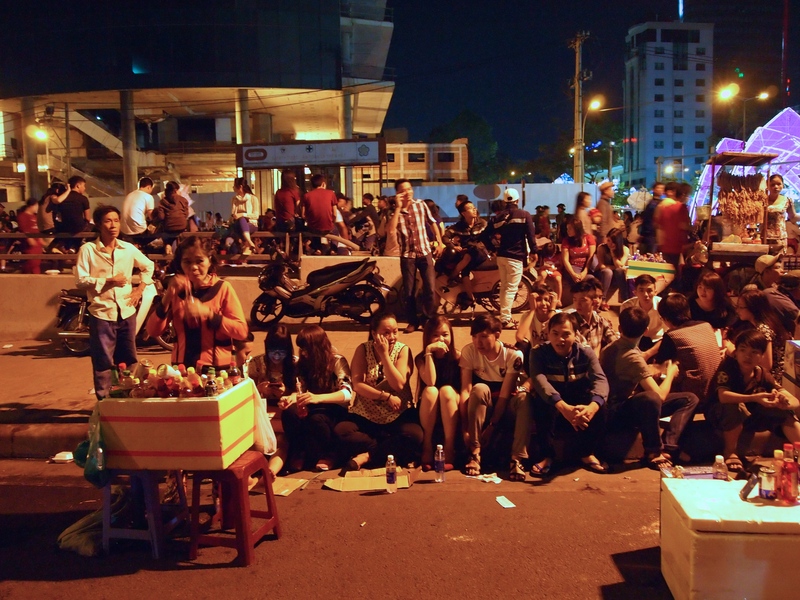 This area of Hanoi shuts its streets off to motorbikes and vehicles on Friday, Saturday, and Sunday evenings. 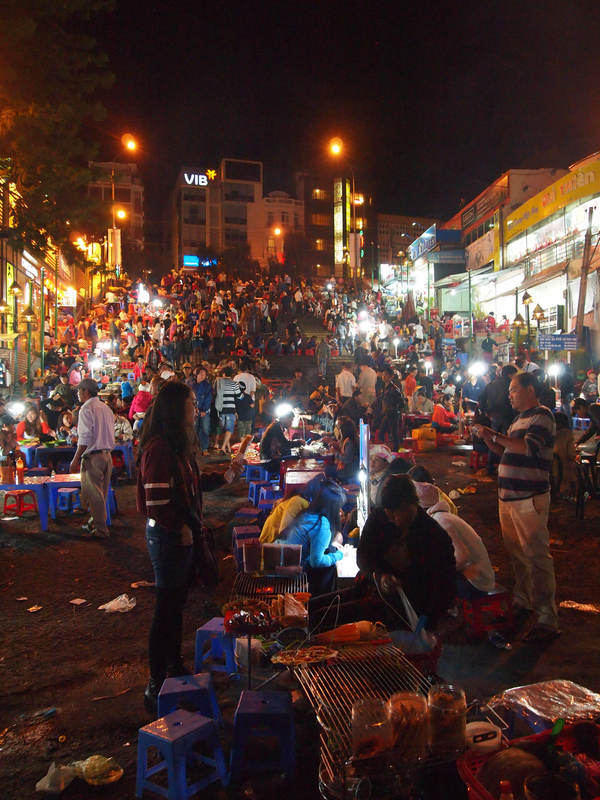 Droves of tourists and locals alike flock to the area to enjoy the relaxed atmosphere and drink Bia Hoi (fresh beer). Guys, this beer costs $0.10 USD per glass. 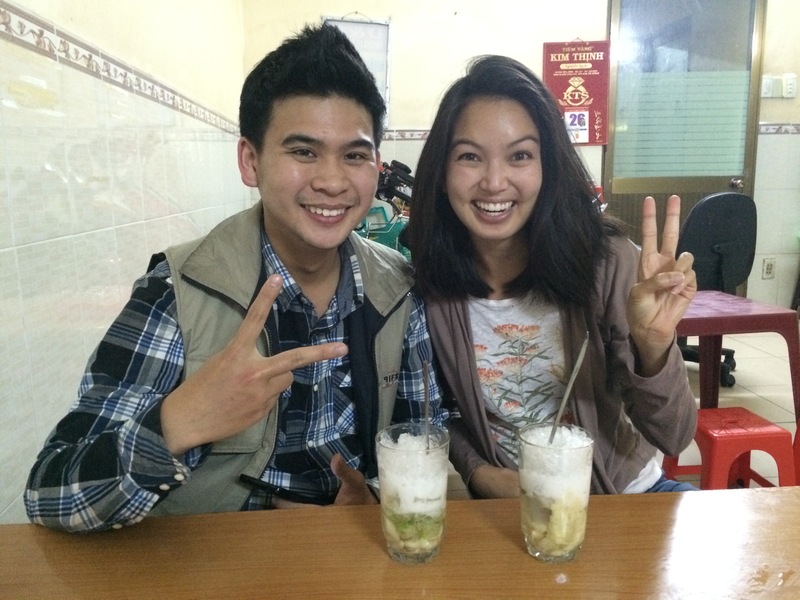 It’s not the greatest beverage you will ever consume, but it’s a Hanoi must-try when in town. 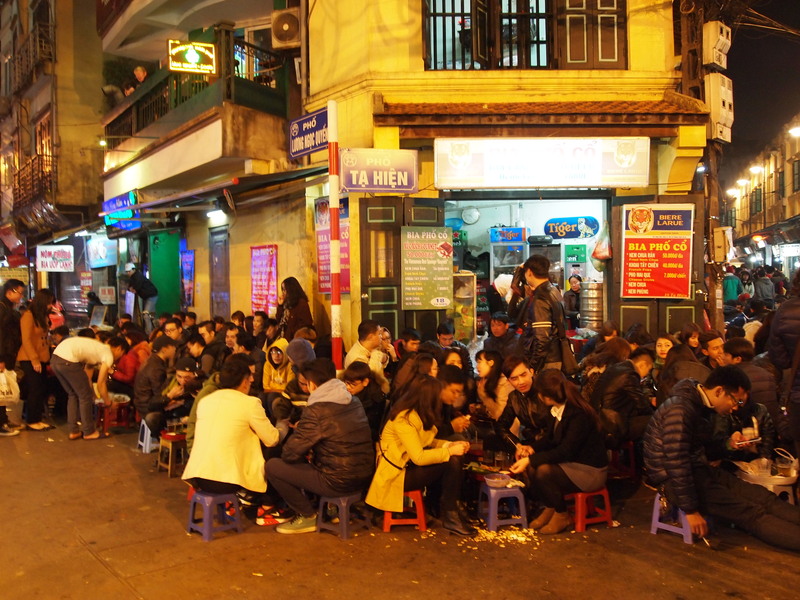 Locals line the streets of the Old Quarter on tiny, plastic stools, enjoying the company of friends with a bit of bia hoi (fresh beer). 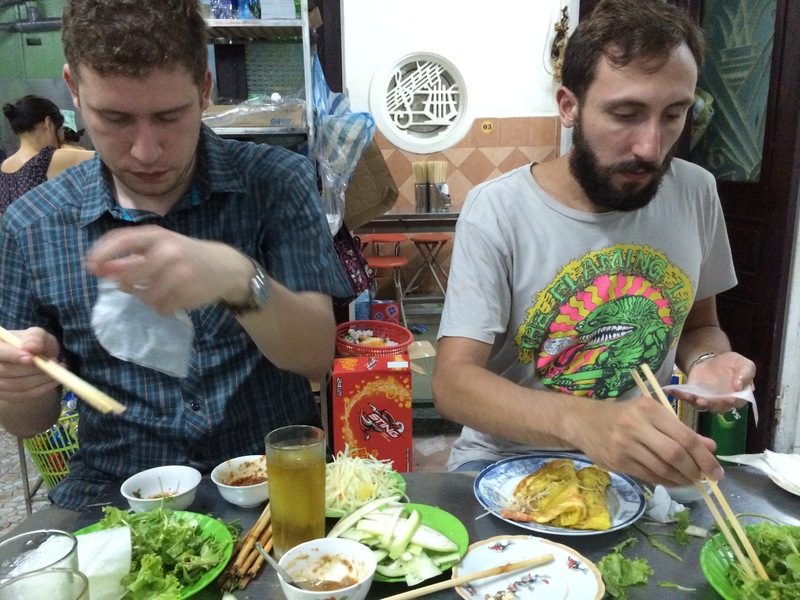 Our short stay in Hanoi was an interesting introduction to Vietnam where we found the government oppressive (more on this later), the food delicious, and the history fascinating. 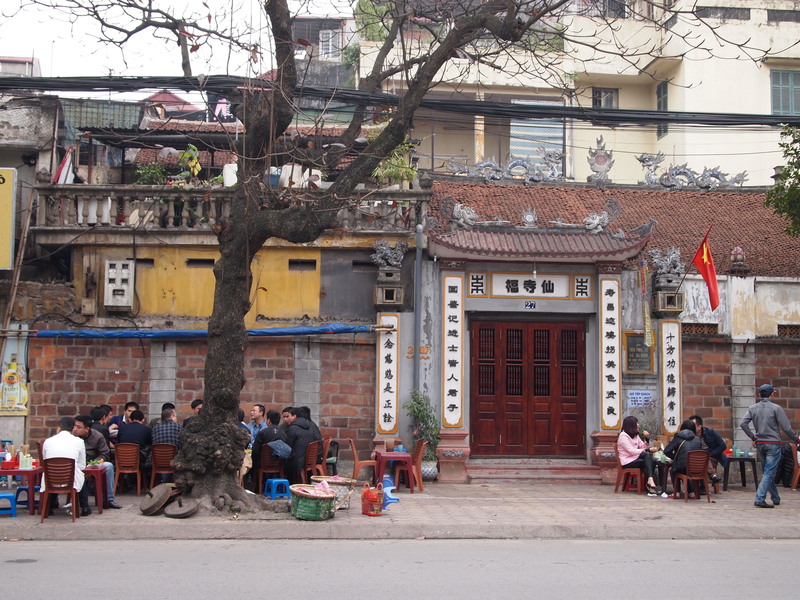 Even though my mom hardly lived in Hanoi at all, my grandparents did for some time, and I felt closer to understanding them as I walked the streets of this beautiful city.